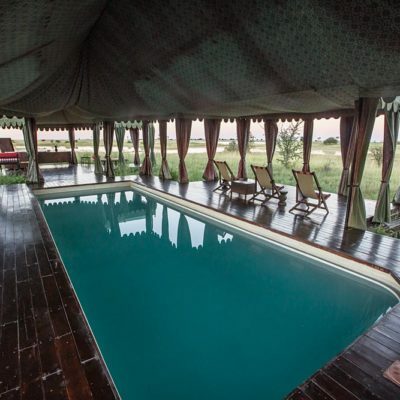 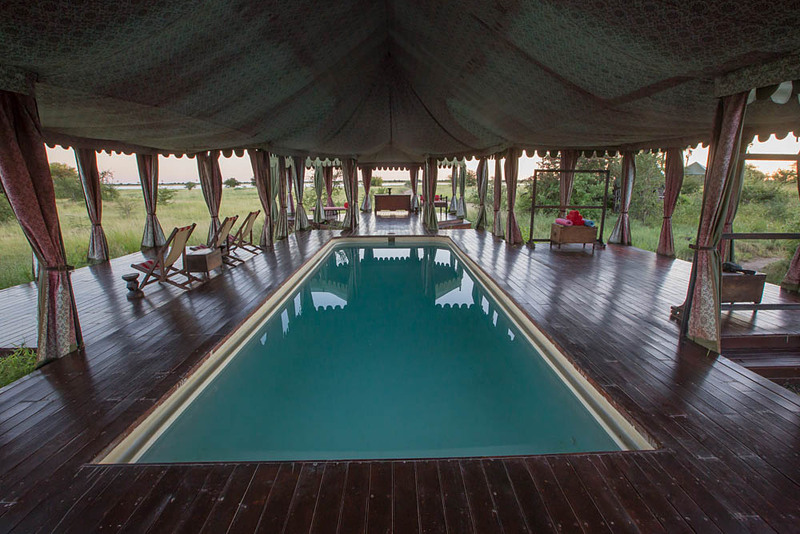 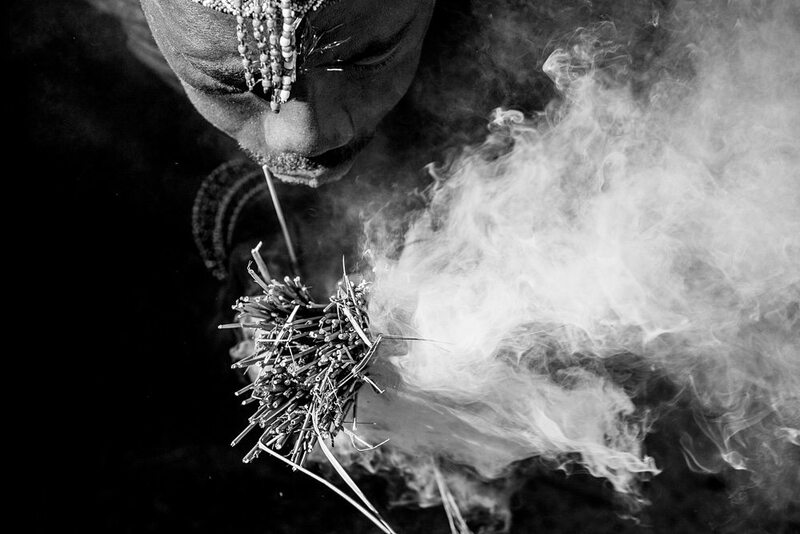 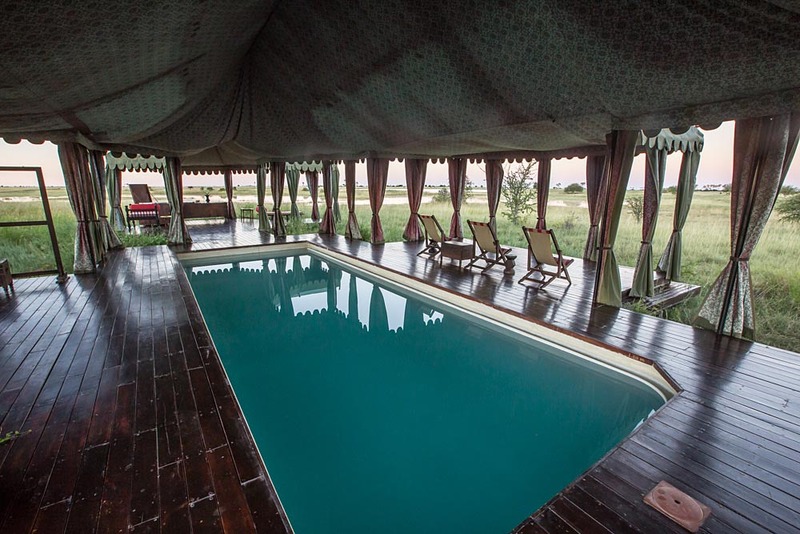 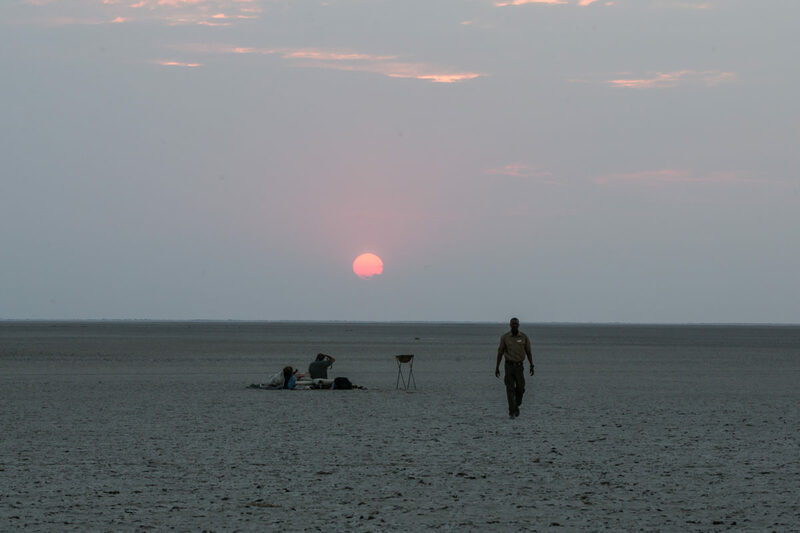 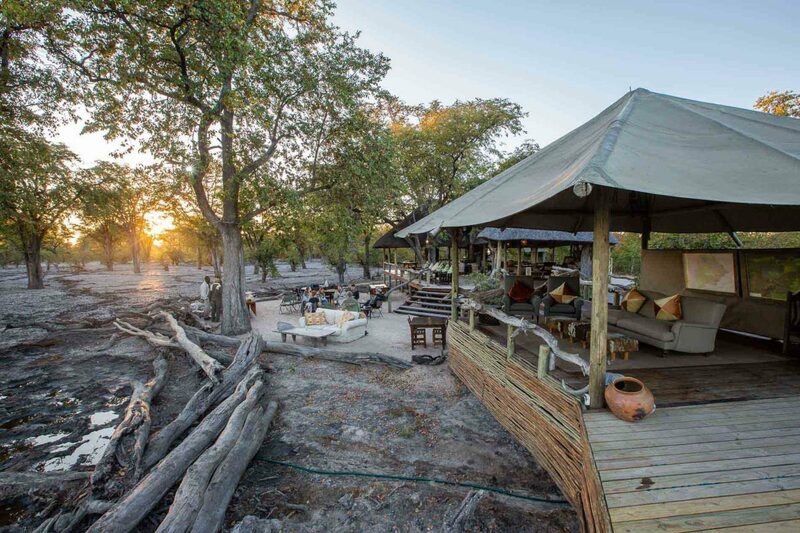 Hyena Pan is a camp for “waterhole” game viewing and economical escapism. 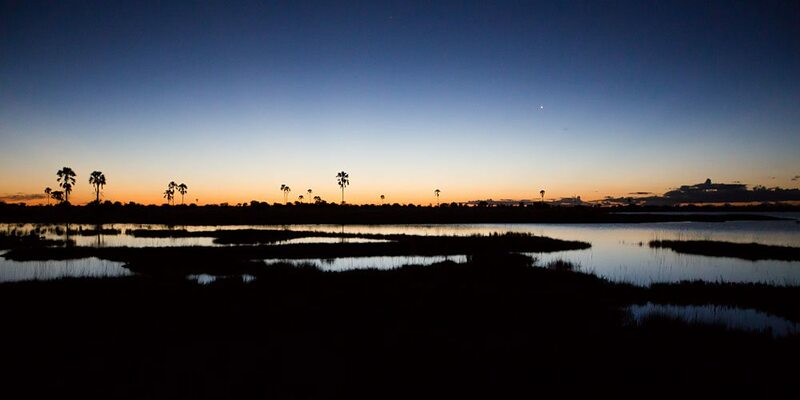 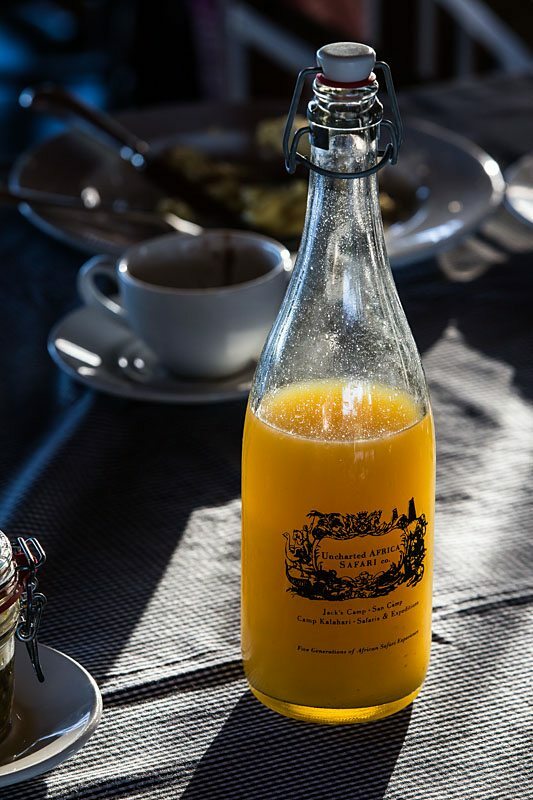 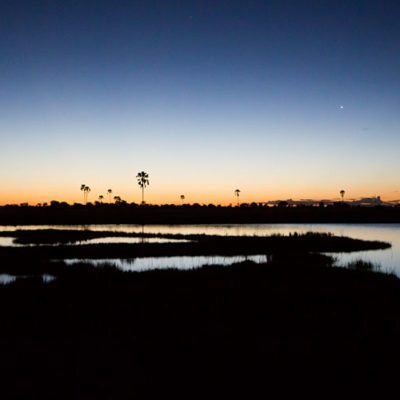 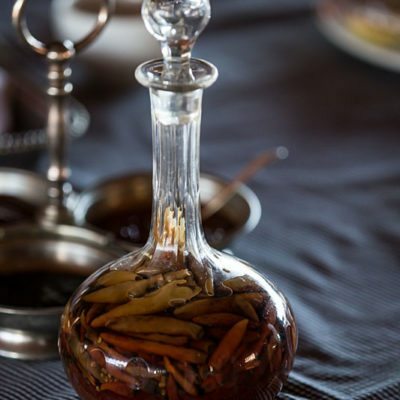 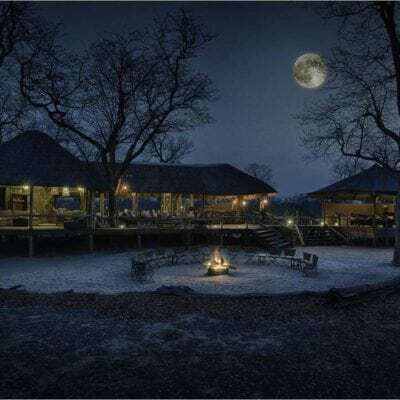 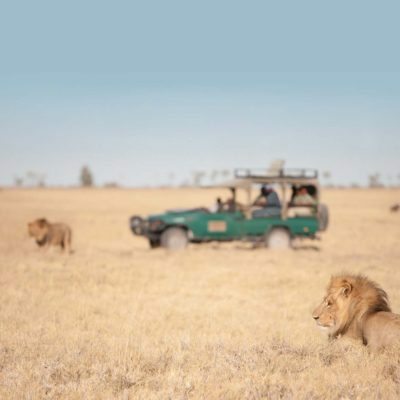 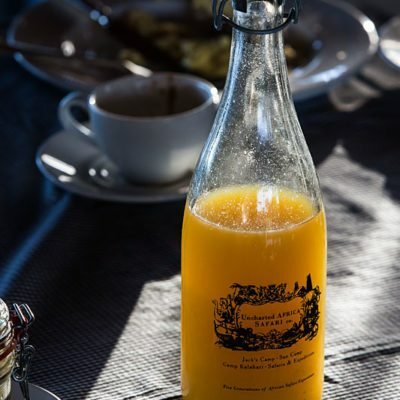 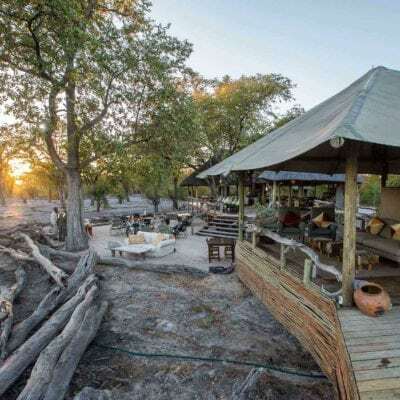 The location, in a belt of Mopane forest, is quite different from traditional ‘game drive” orientated lodges, as the immediate area around Hyena Pan lacks rivers and wide open spaces. 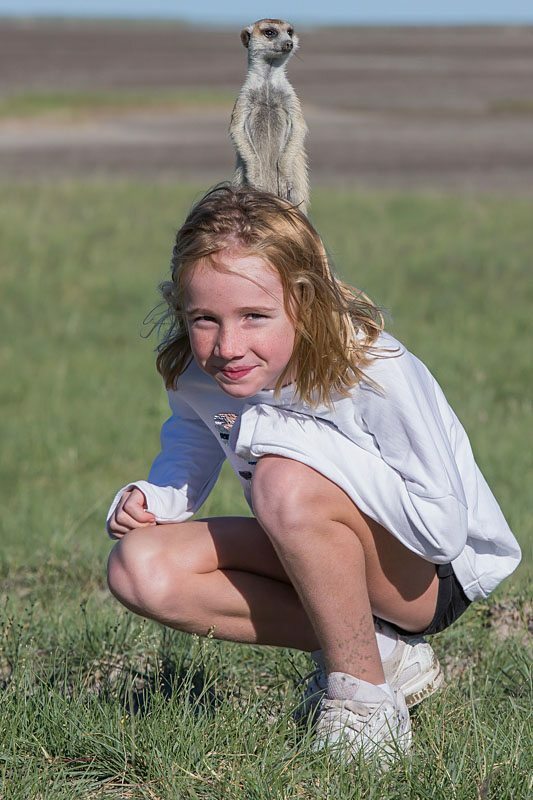 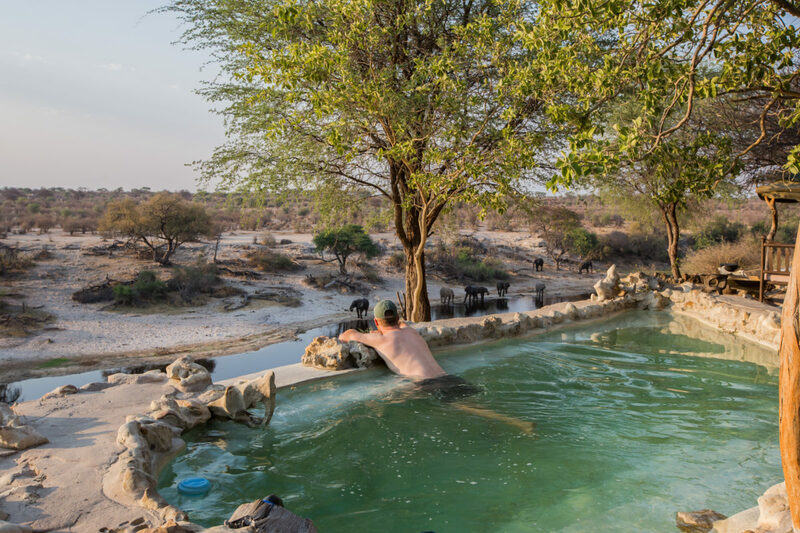 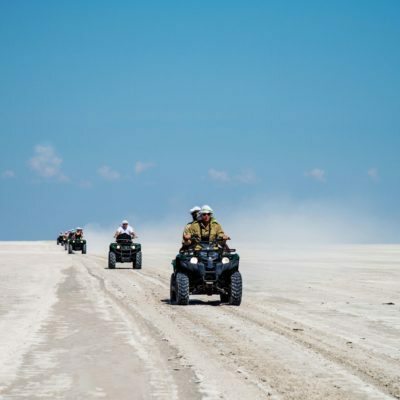 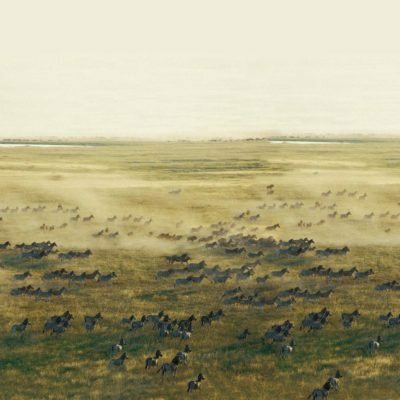 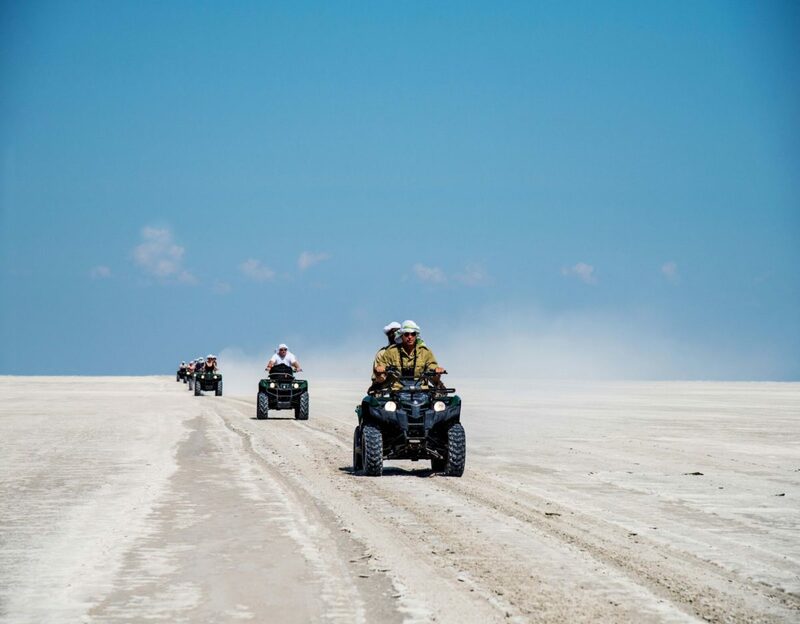 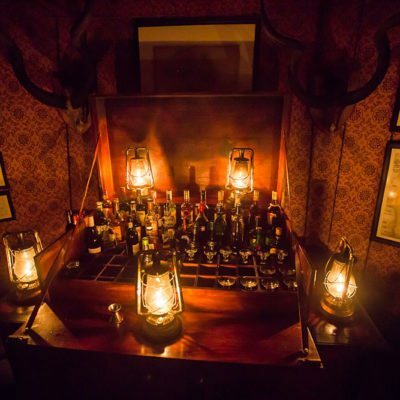 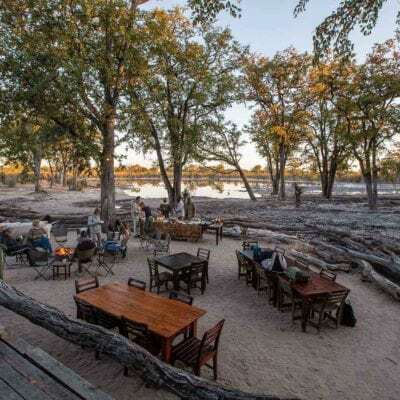 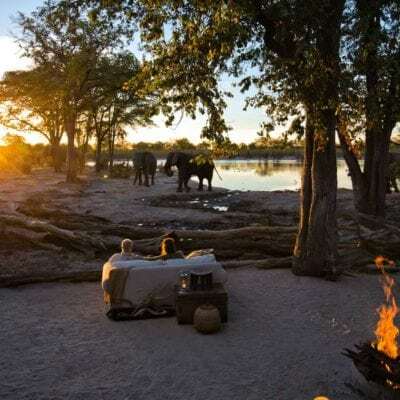 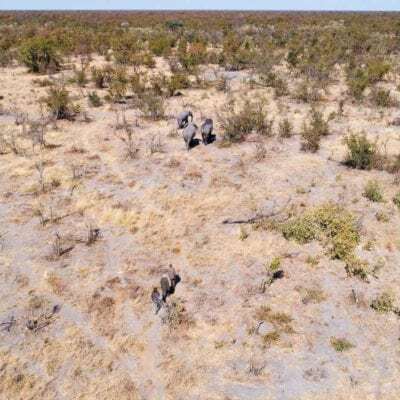 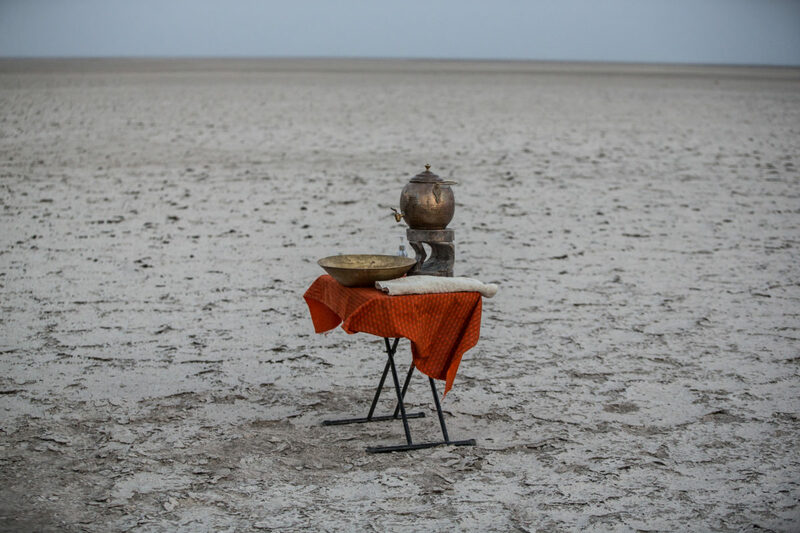 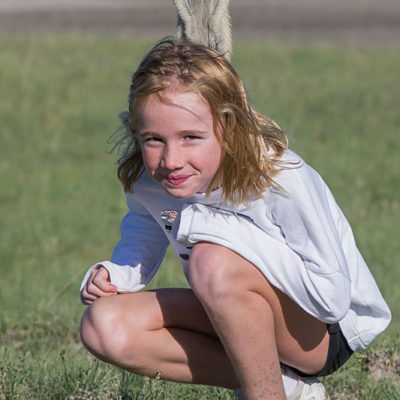 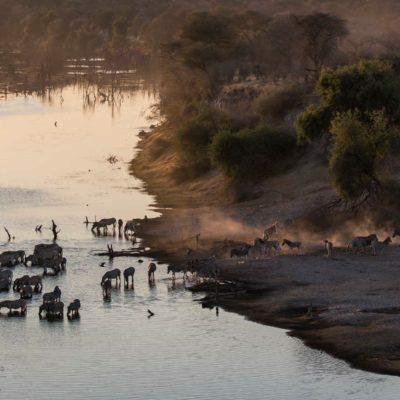 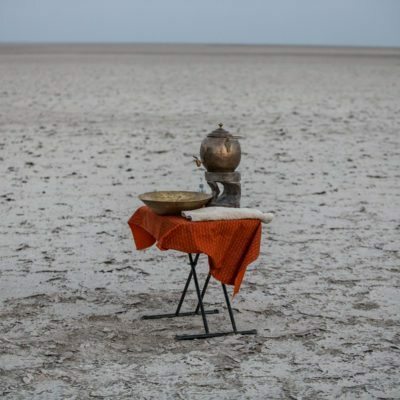 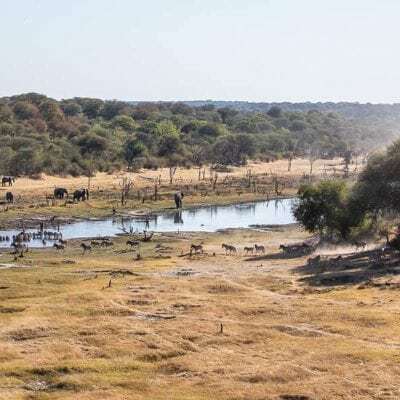 Instead, the concession managers have created a scenario, with strategically located waterholes, to attract game to the lodge and surrounding pans. 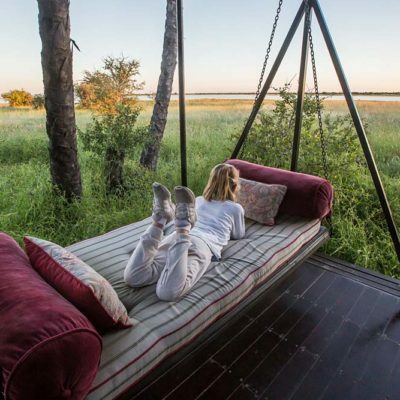 There are unique and exciting activities based out of this camp ( The “Skybeds” for example) so do read on for more inspiration….. 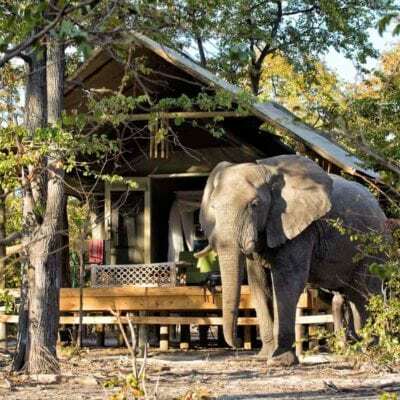 This lodge is accessible by road and is only an hour drive from the North entrance gate of Moremi. 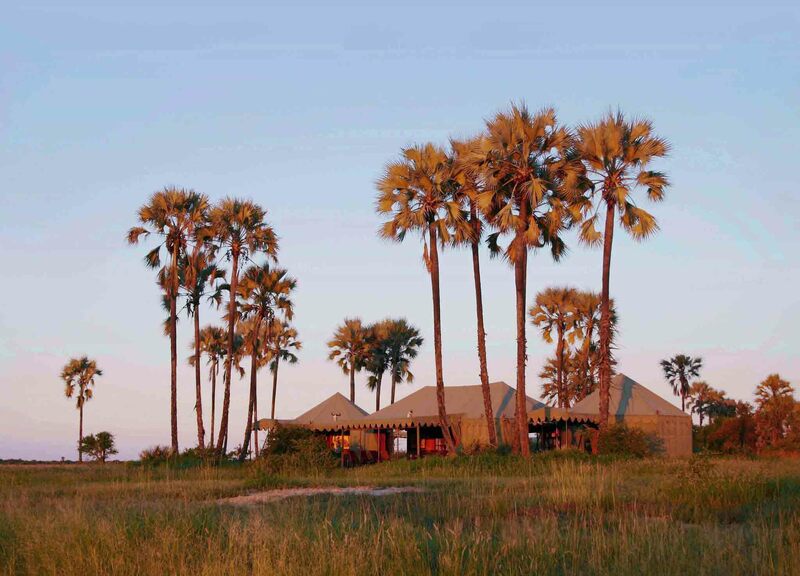 There is also an airstrip but note that this transfer can take 1 hour or more . 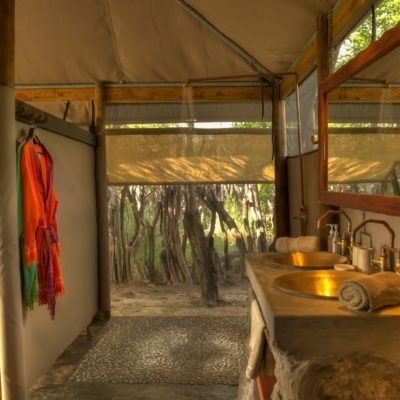 It is accessible as part of an itinerary on a mobile safari as it is very close to the popular Khwai Community Concession game drive area. 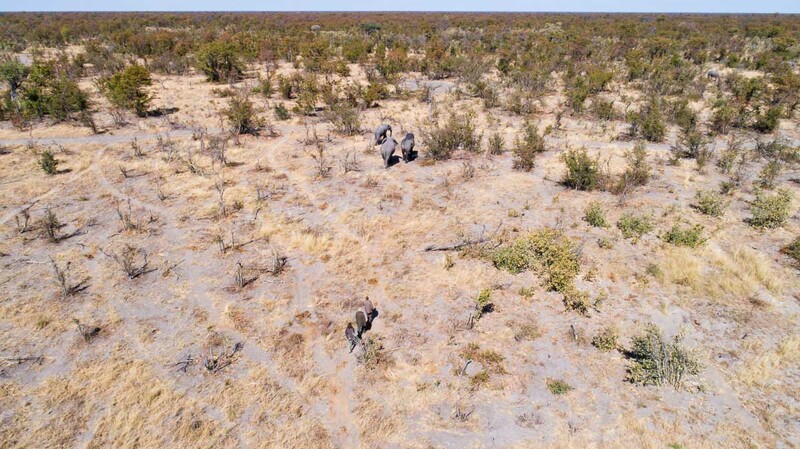 Admittedly, this concession does have relatively thick bush compared to other areas, being located in the “Mopane-belt” ecotone. 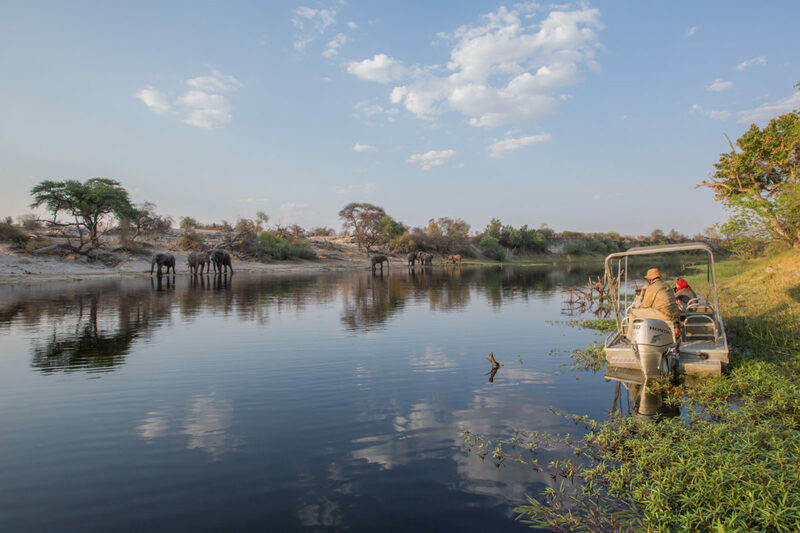 This is a habitat of the dominant mopane tree that grows thick and mostly impenetrable. 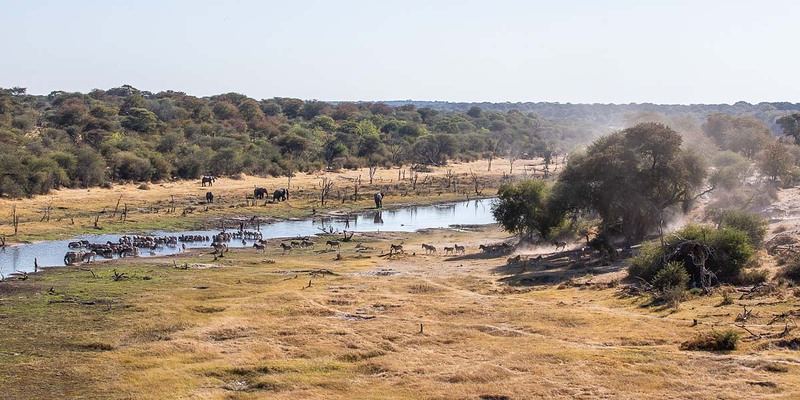 However, the full complement of predators are all present as well as herds of elephants, buffalo and plains game including eland, sable and roan! 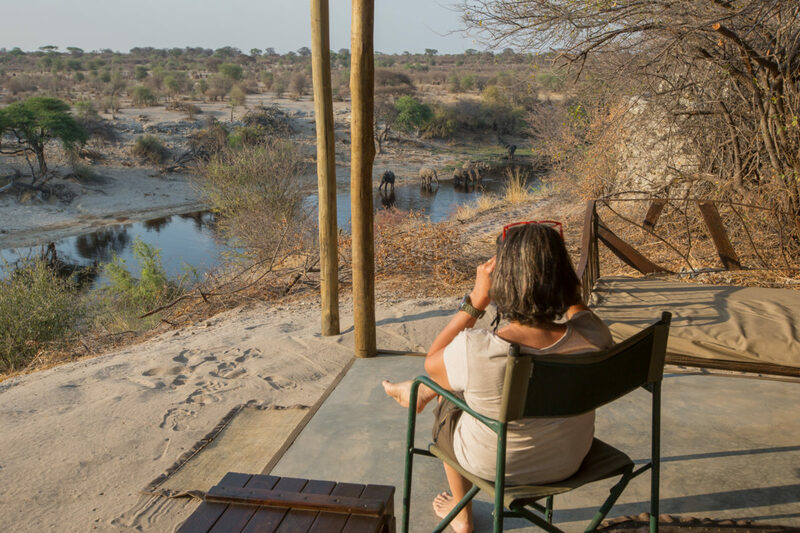 This makes the area standout as one of the best places for “sit-and-wait” game viewing at various waterholes dotted around the concession. 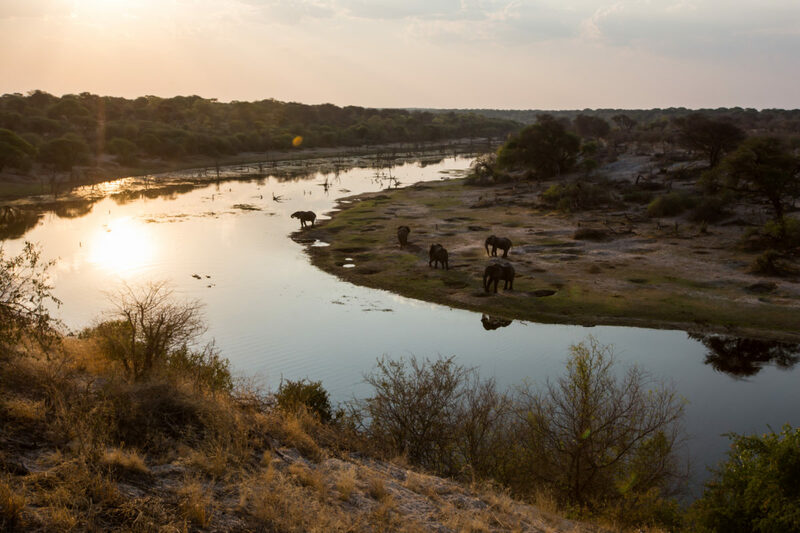 In the dry season, borehole pumps work overtime to provide fresh drinking water for huge herds of elephants. 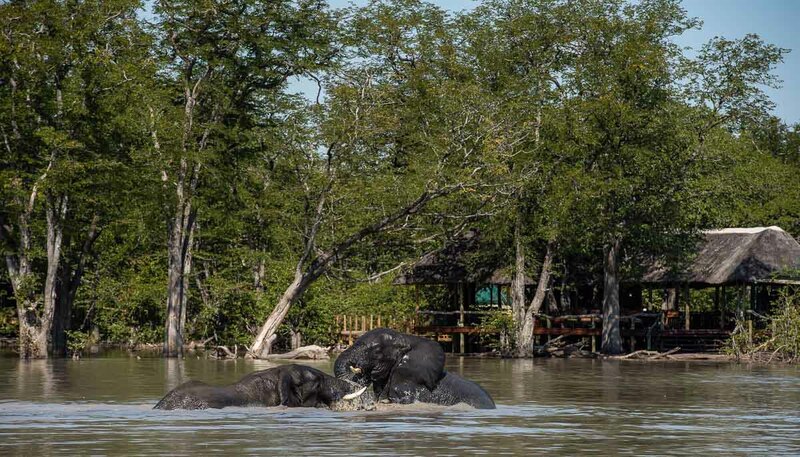 Indeed, it becomes quite a challenge to keep up with the water demands! 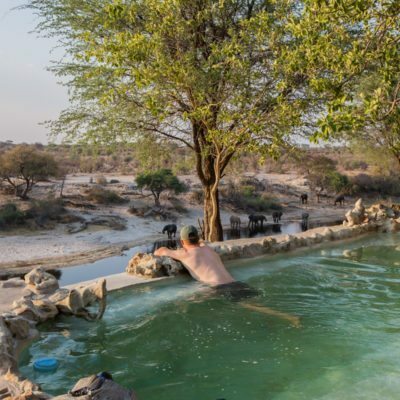 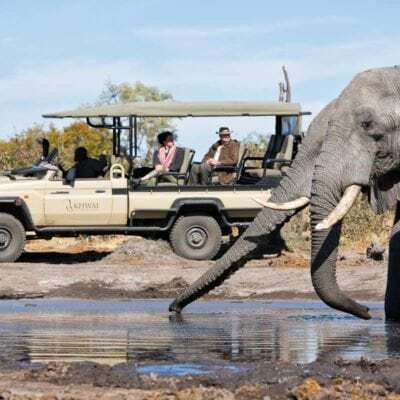 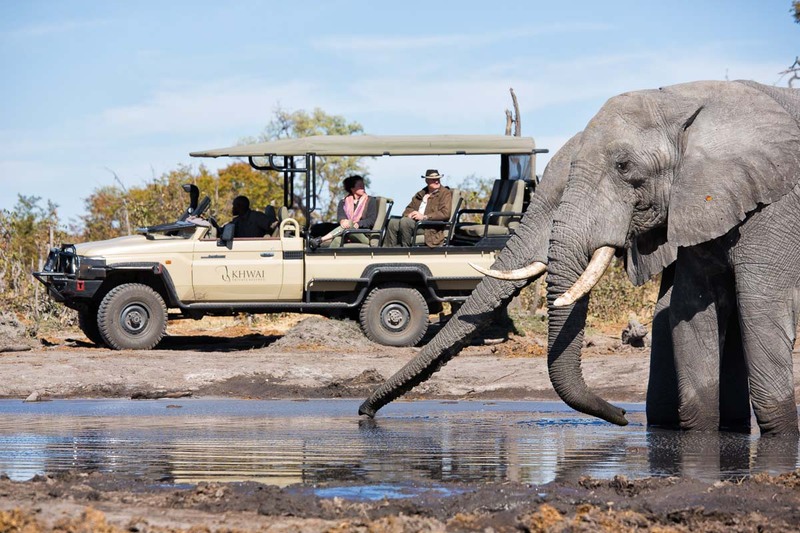 Guides visit these waterholes on game drives and so a lot of the game viewing is based around this type of process. 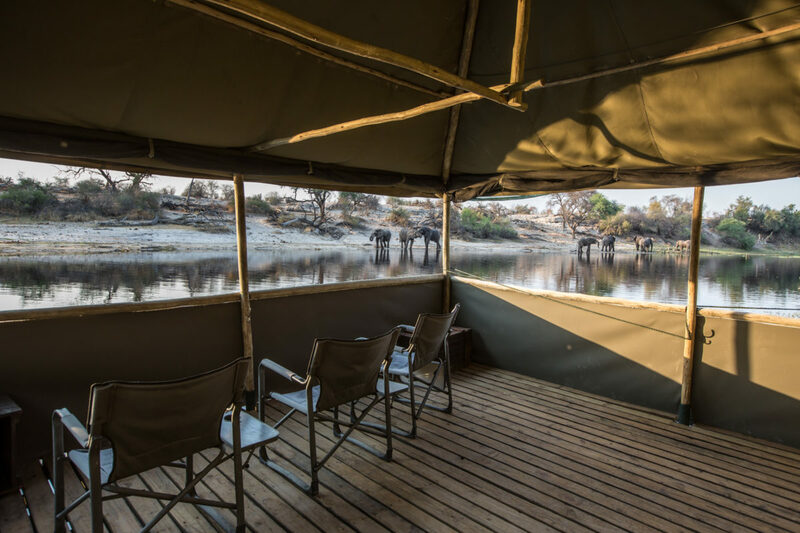 Further, the innovative concession owners are constantly thinking of ways to better view the game – there is a sunken ground level hide now, where you can sit eye-to-toe with many elephants. 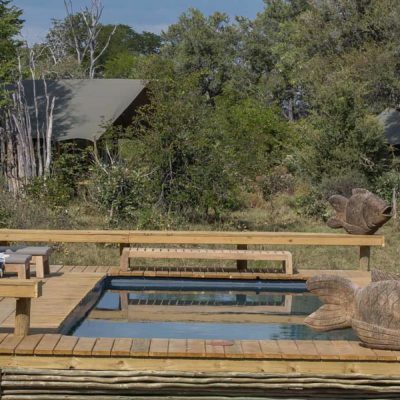 There is also a raised platform at one waterhole for elevated sundowners and others where you can just park and observe. 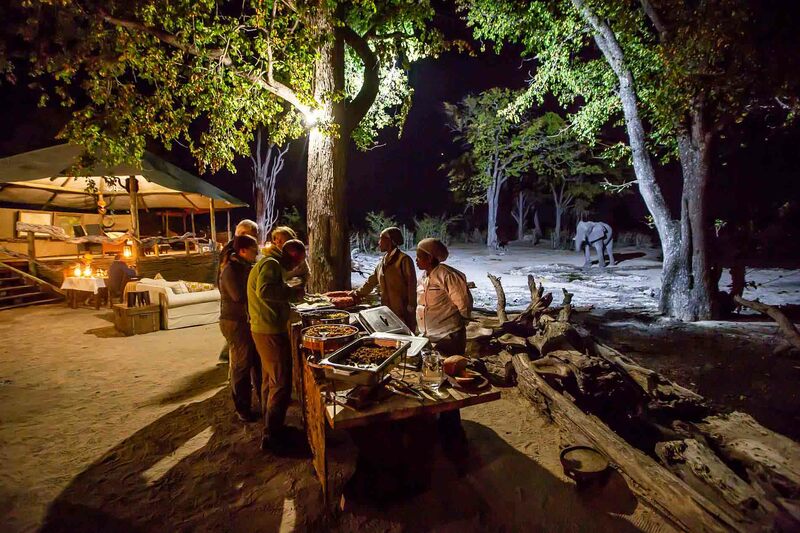 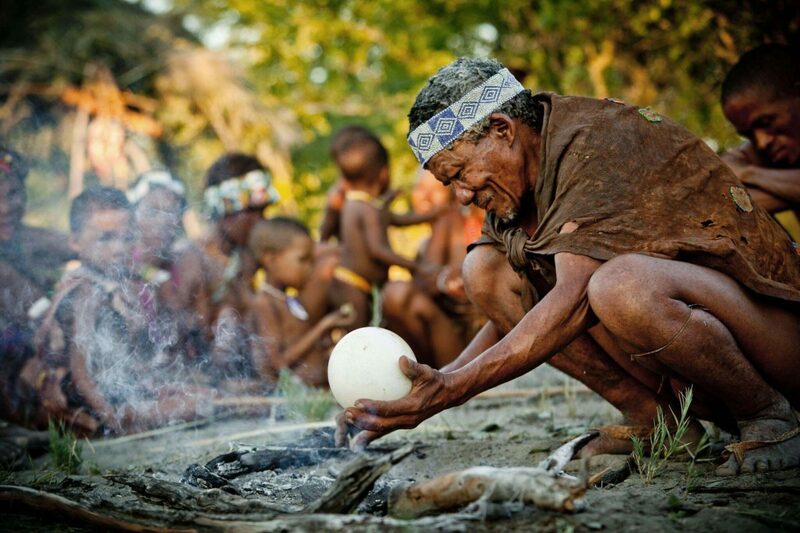 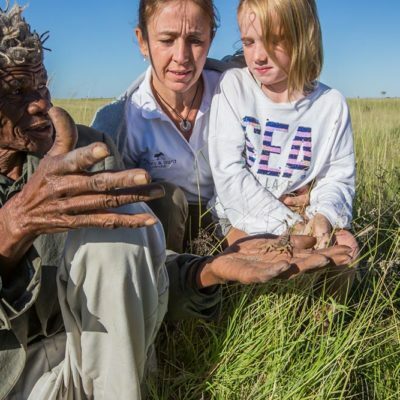 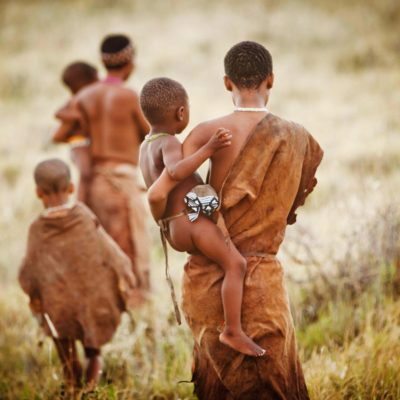 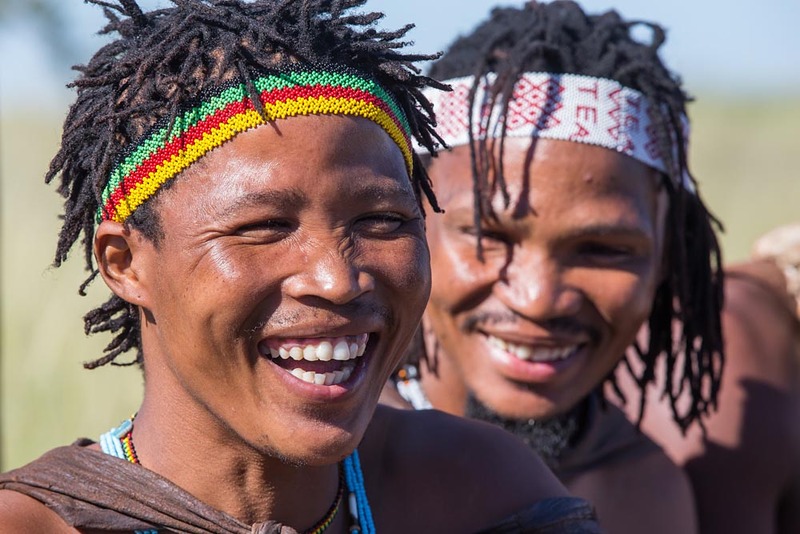 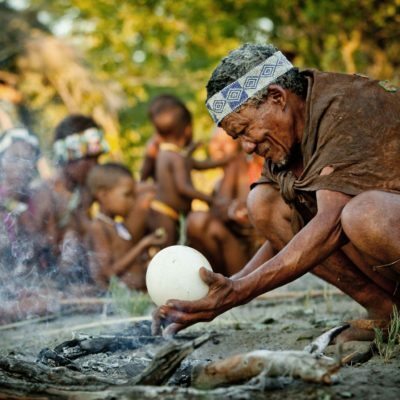 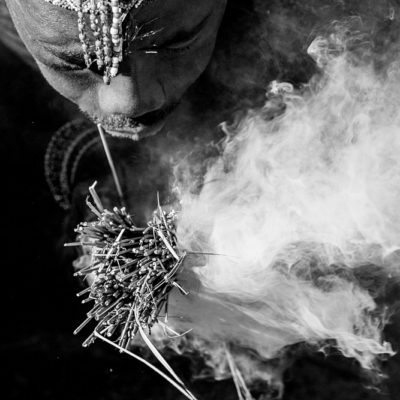 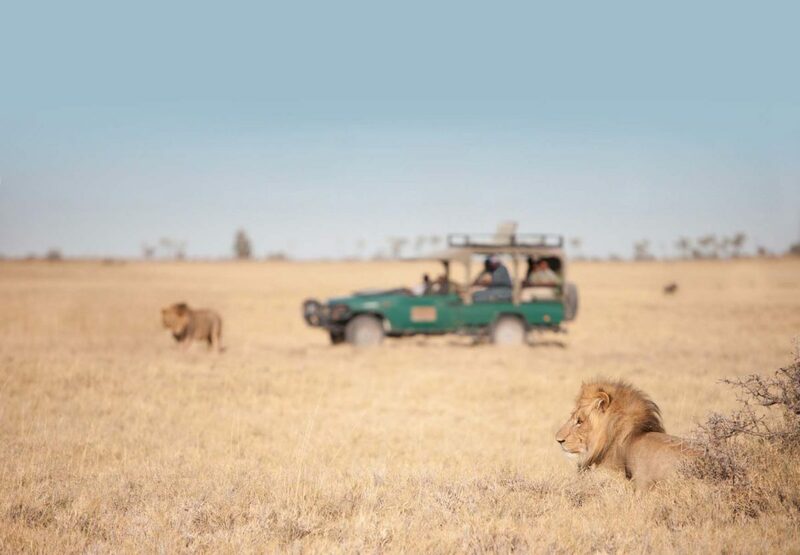 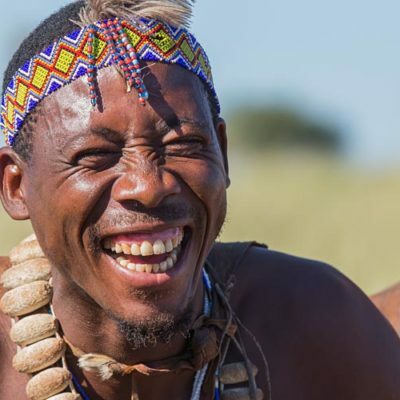 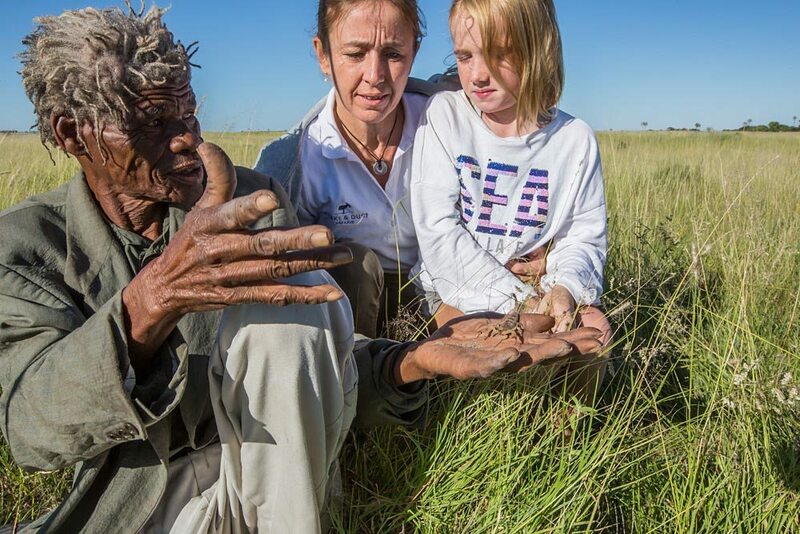 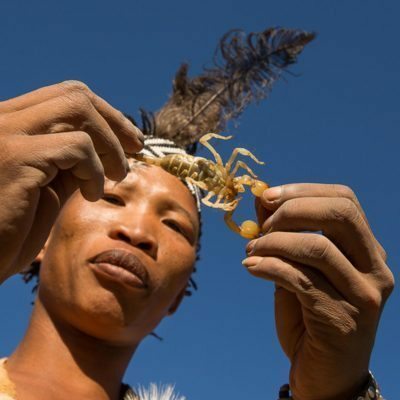 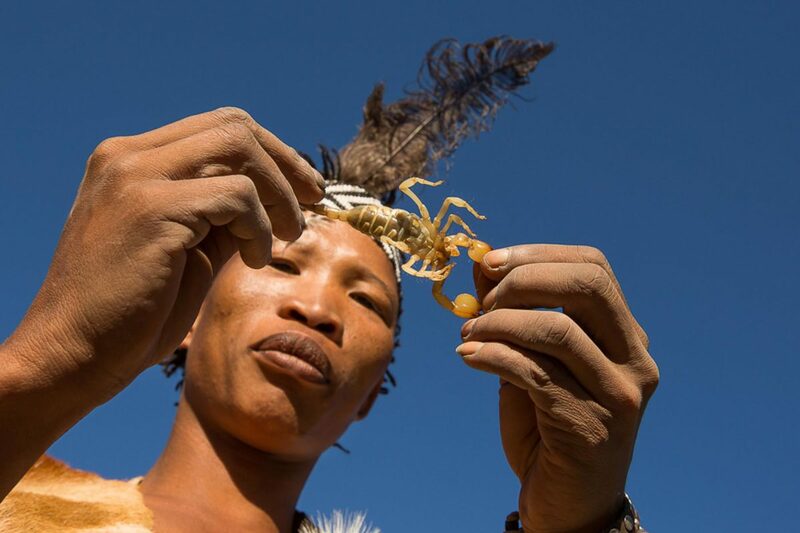 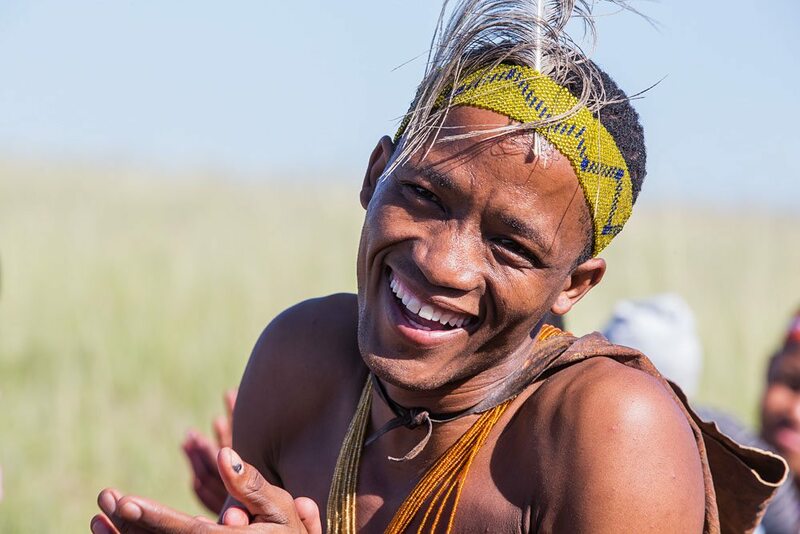 Extended game drives are offered to the Khwai Community Concession where predator viewing is at its best. 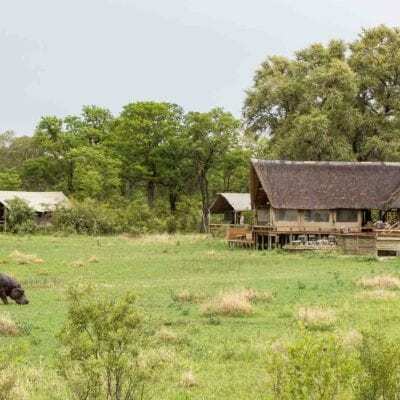 There is a 30-40 minute drive time to get to this area so you may only get one drive in Khwai and it may hinder some of you early morning sightings. 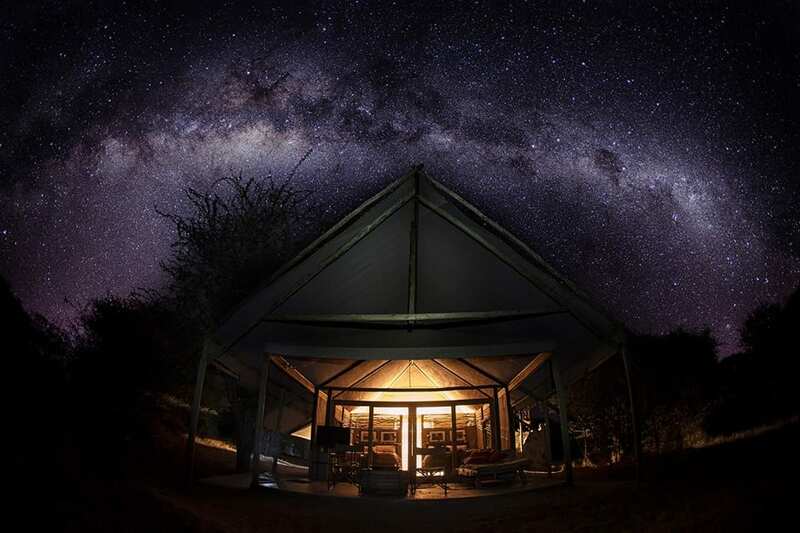 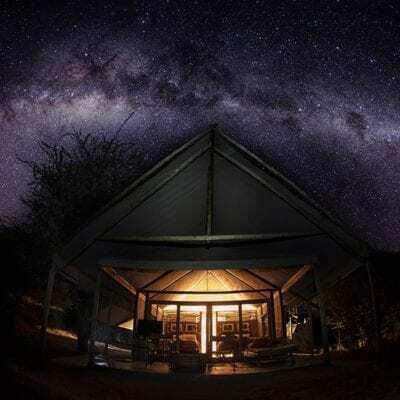 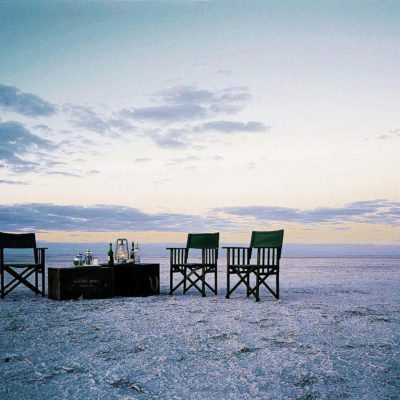 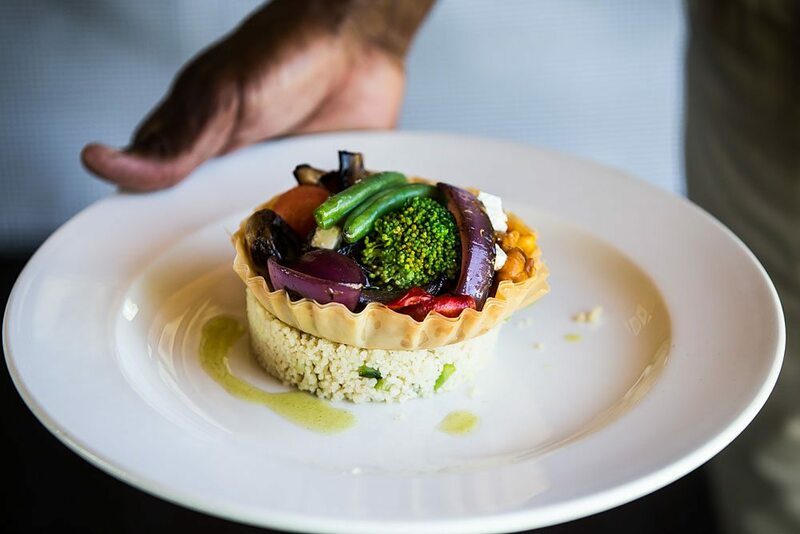 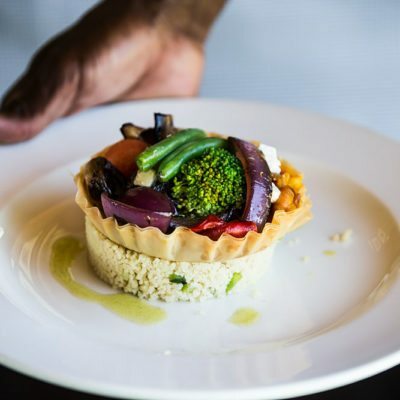 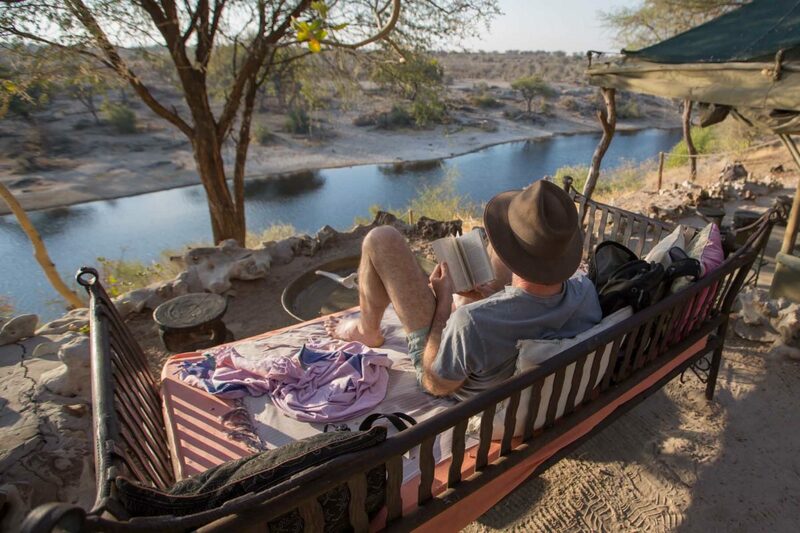 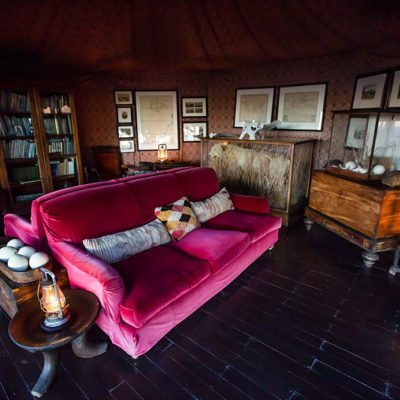 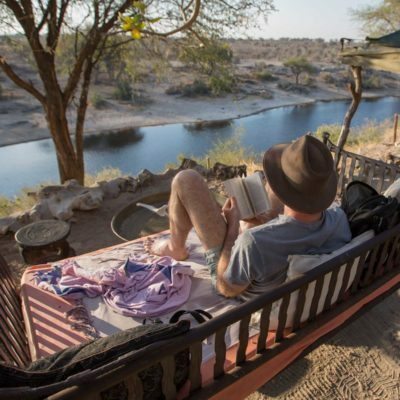 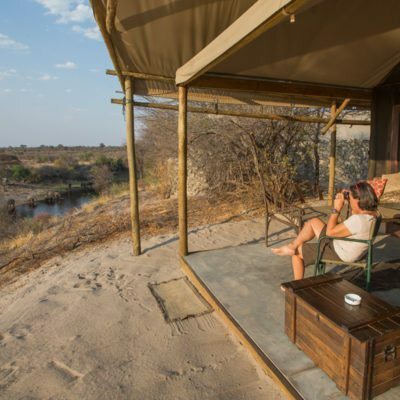 We recommend that you add a night sleep out on the SKYBEDS – this is definitely a main highlight of staying in this concession and we highly recommend combining it with Hyena Pan! 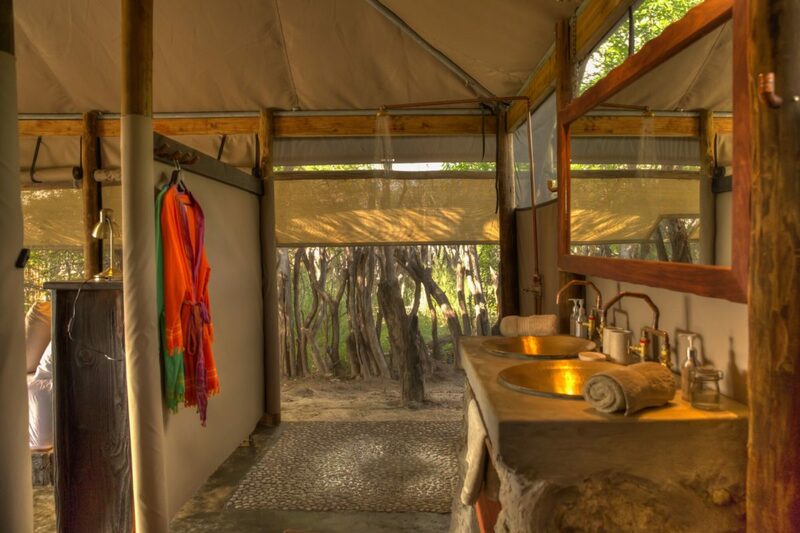 As the area is private, guides will also offer nature walks. 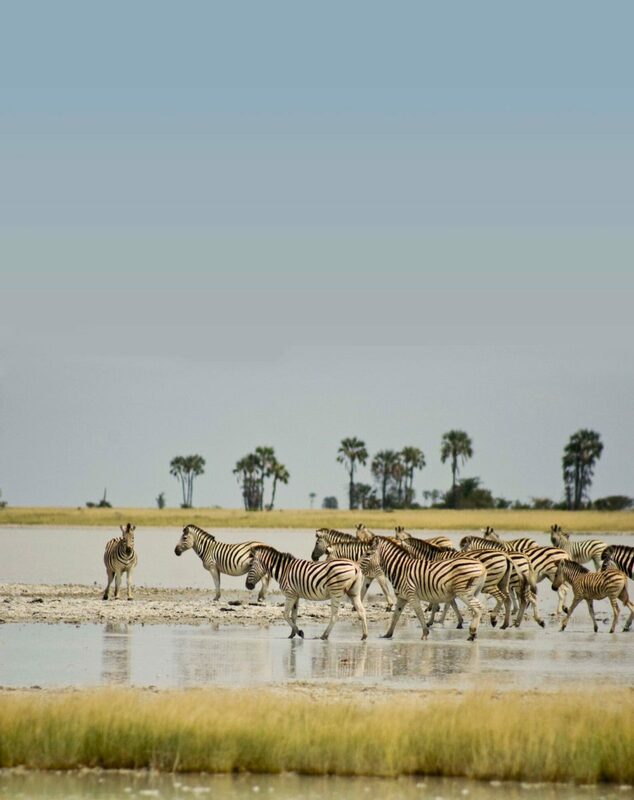 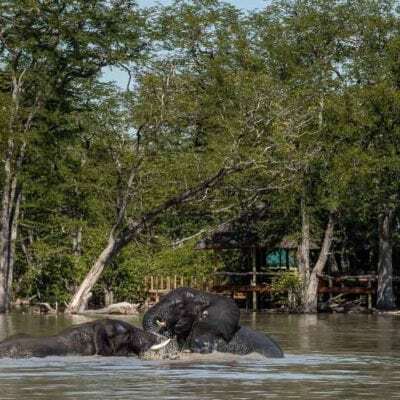 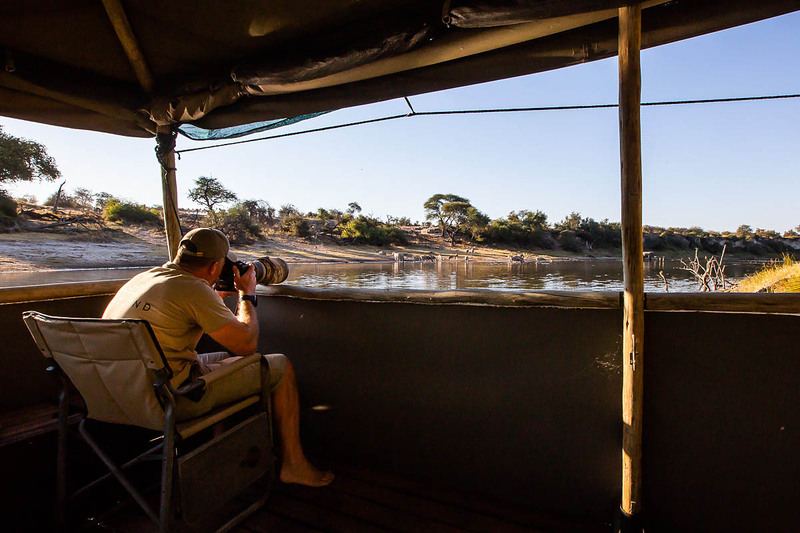 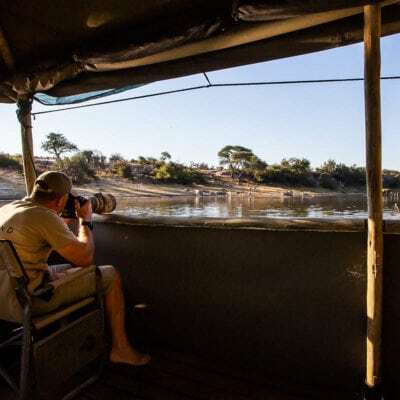 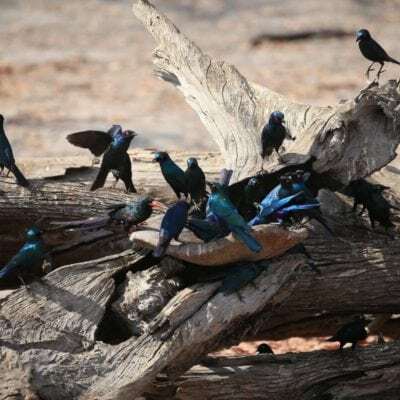 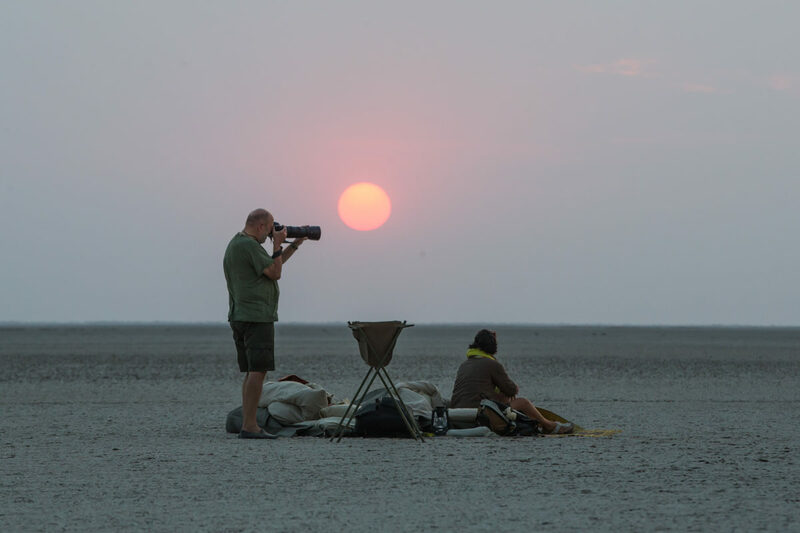 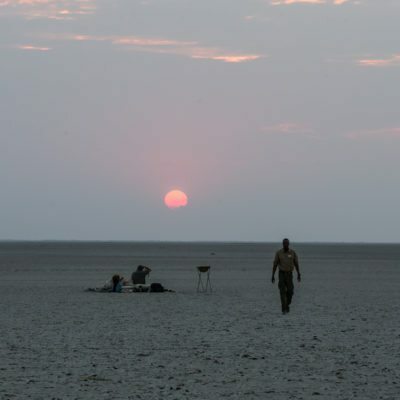 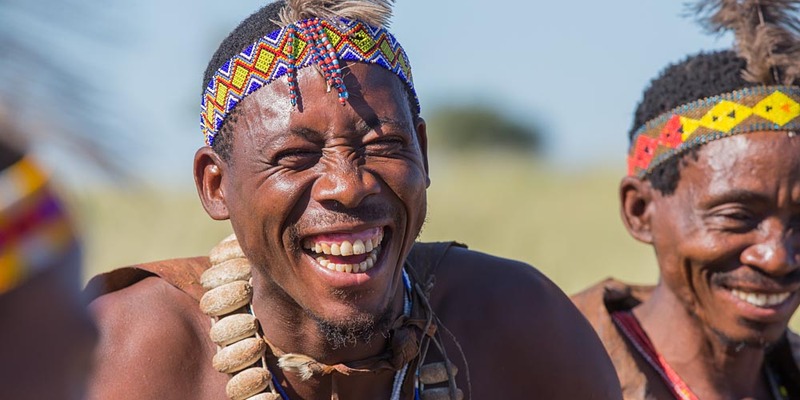 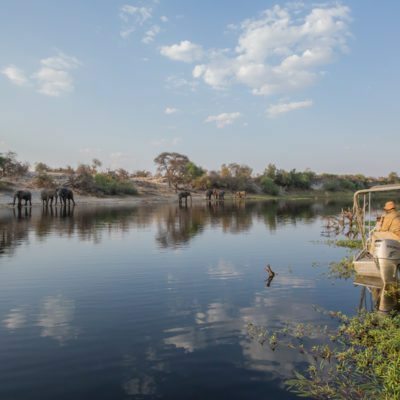 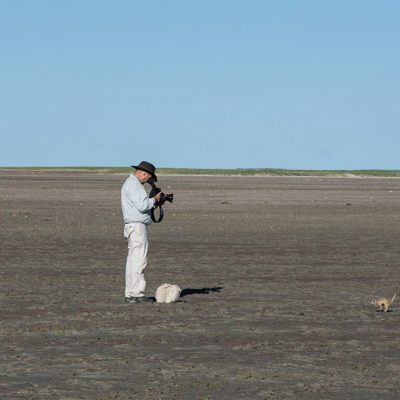 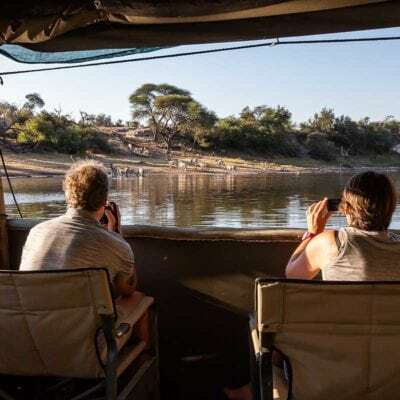 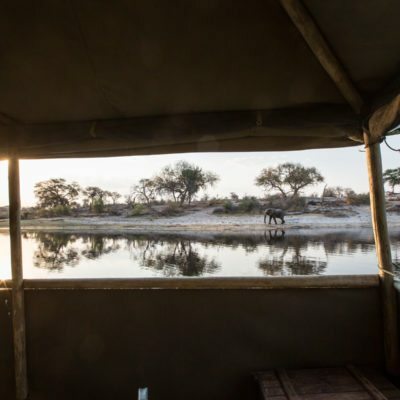 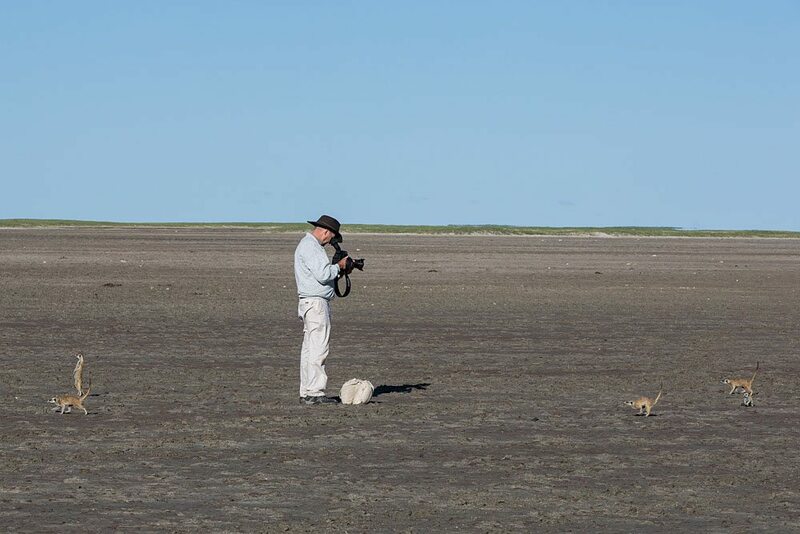 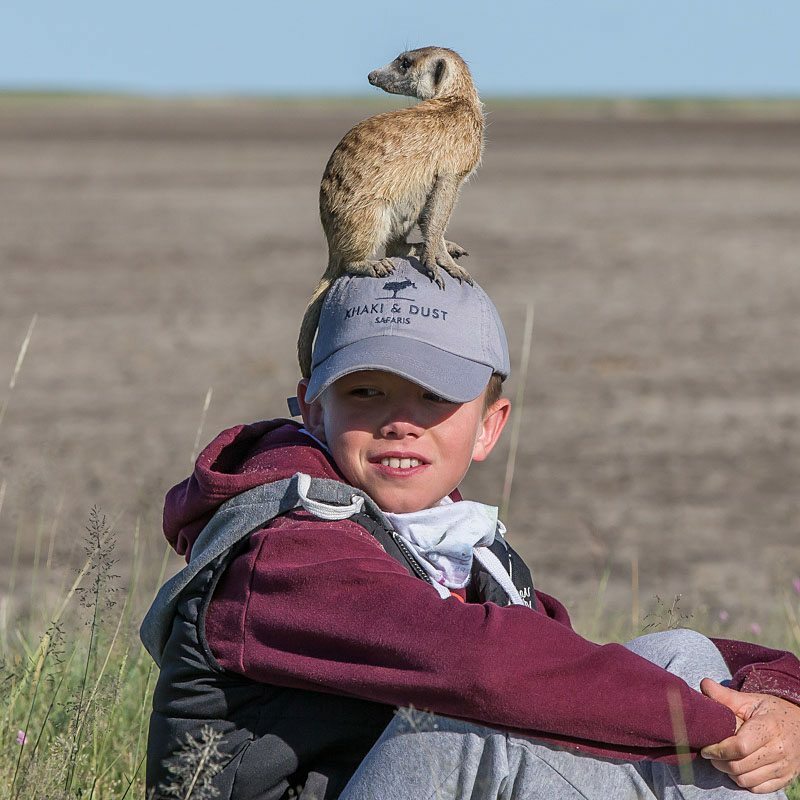 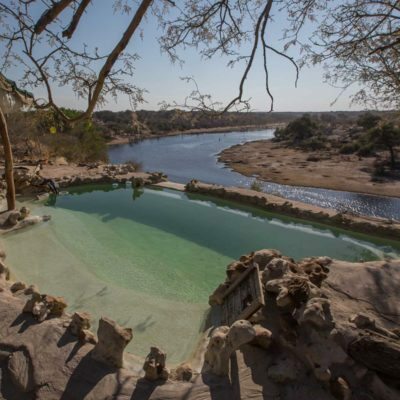 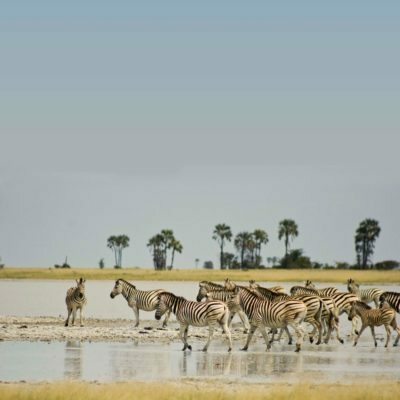 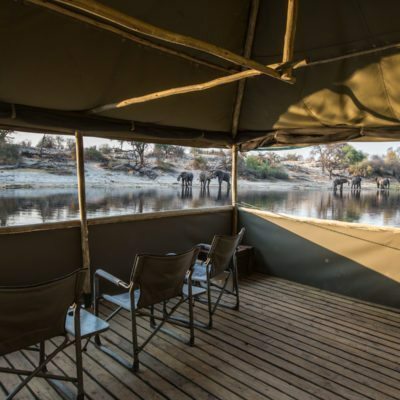 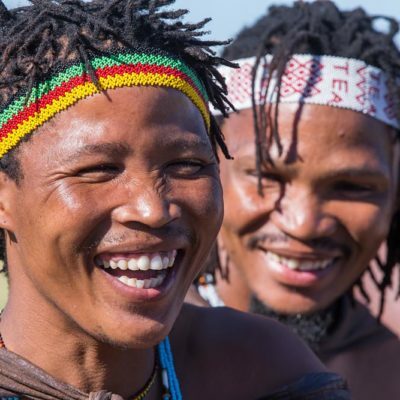 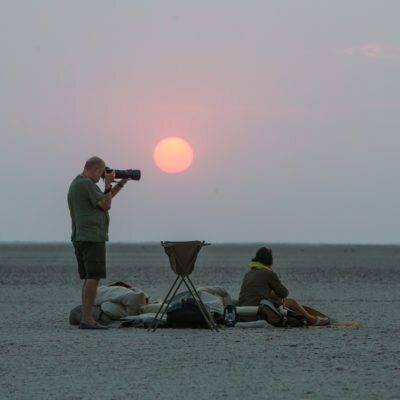 It must be noted that the activities available in this concession are likely to keep on improving as the concession managers are looking to build more hides and viewing platforms at some of the seasonal waterholes in the concession. 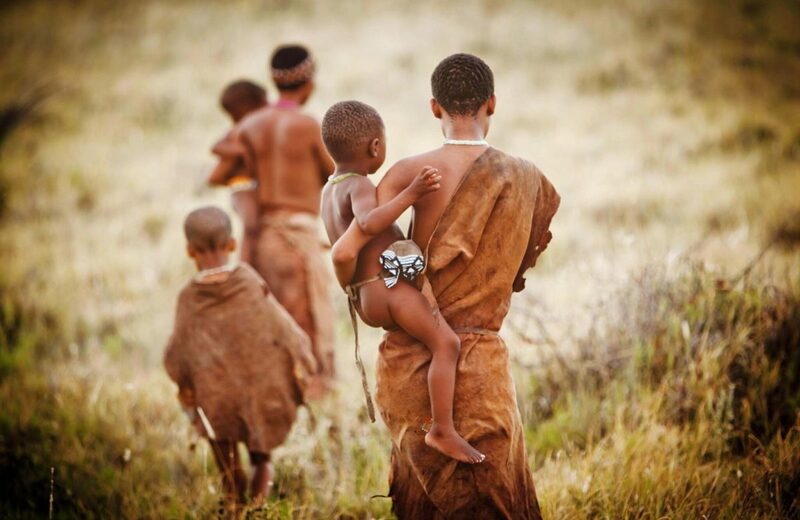 We will keep things updated in this regard. 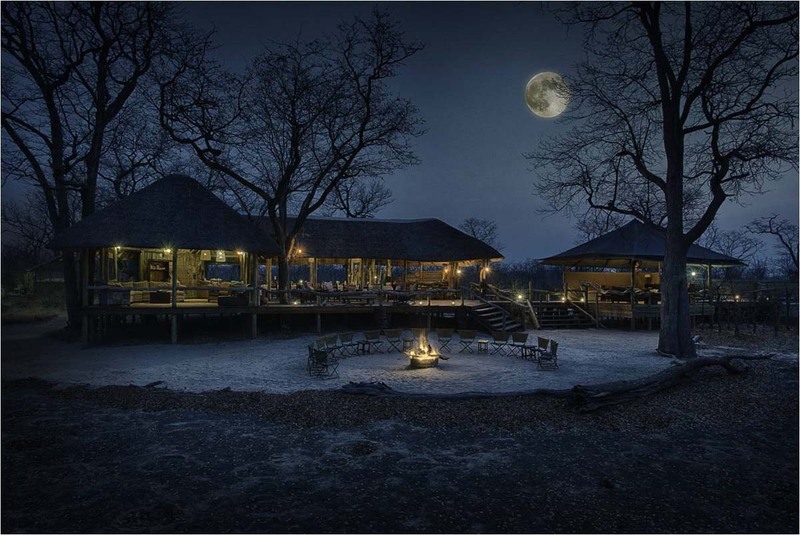 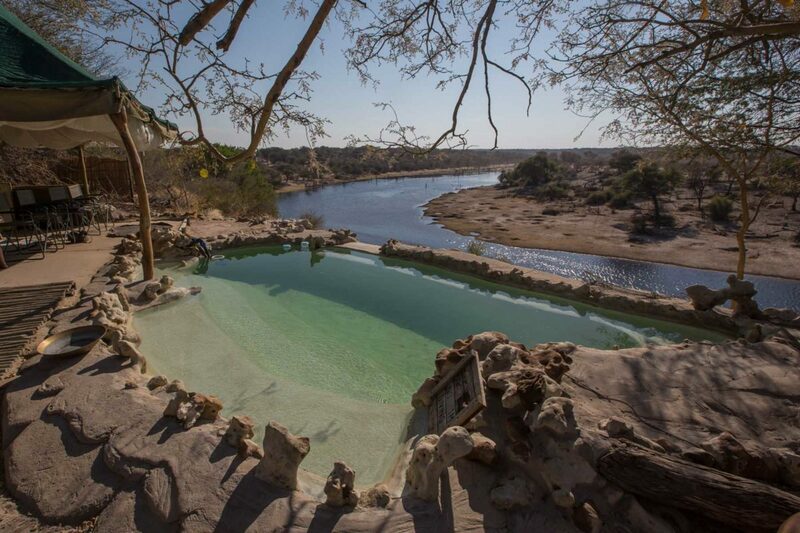 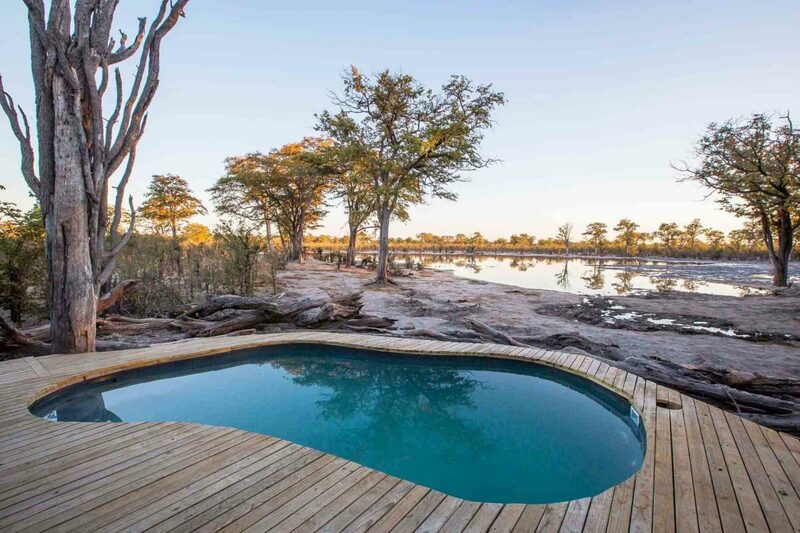 The lodge has been built on the site of a natural waterhole. 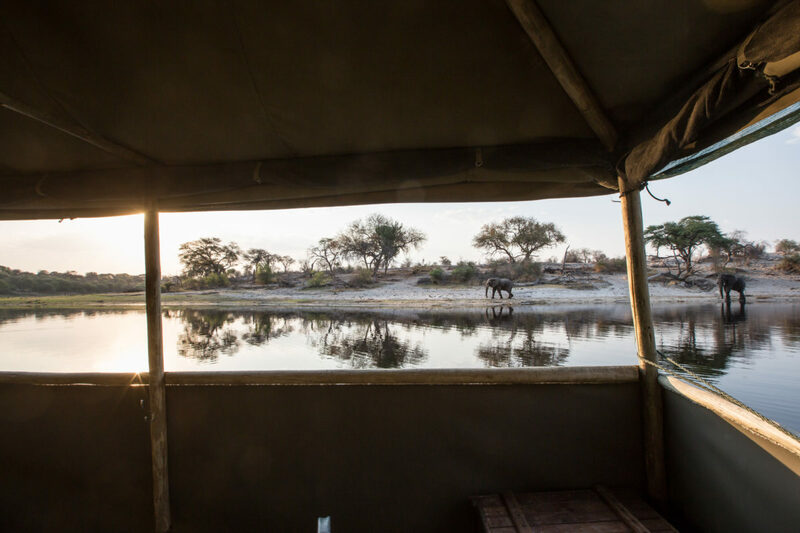 Animals are drawn in from the surrounding bush and an additional borehole is constantly pumping fresh water to keep up with the demands of the animals. 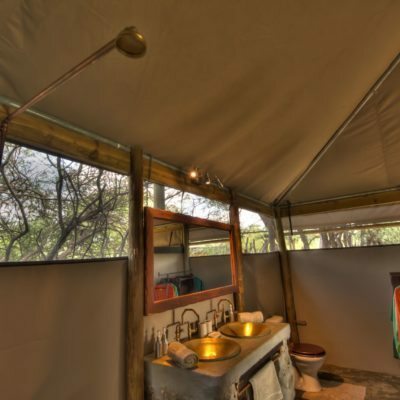 This means you can see wildlife from the camp itself! 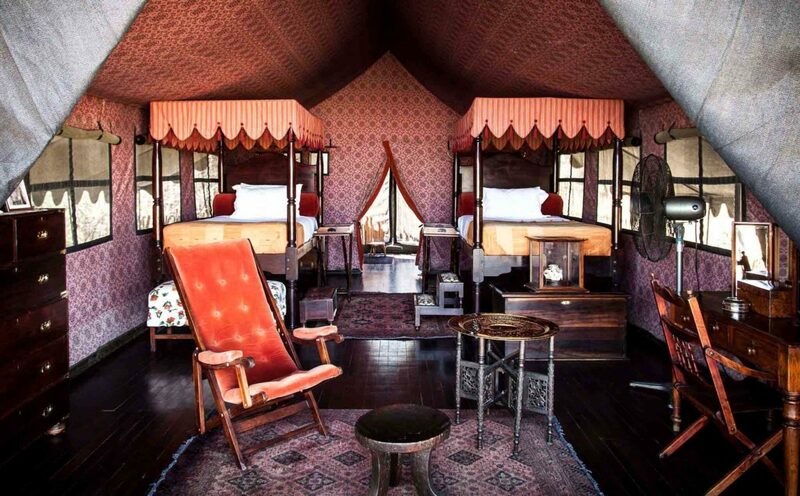 This is by no means a super stylish and lavishly expensive camp. 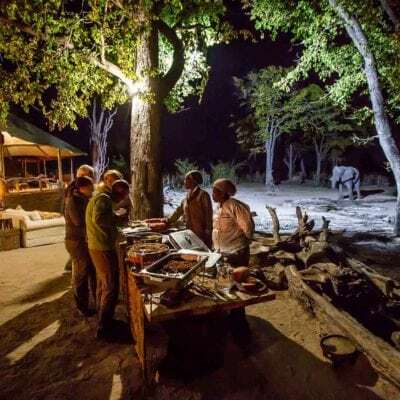 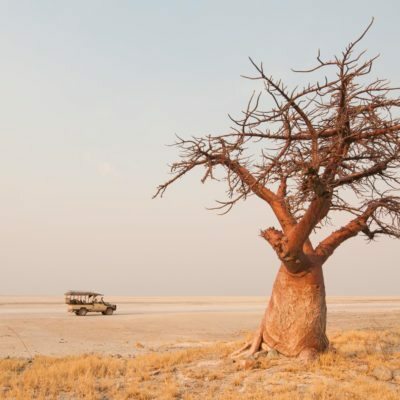 Quite the opposite in fact as it is aimed at those seeking a more affordable safari option. 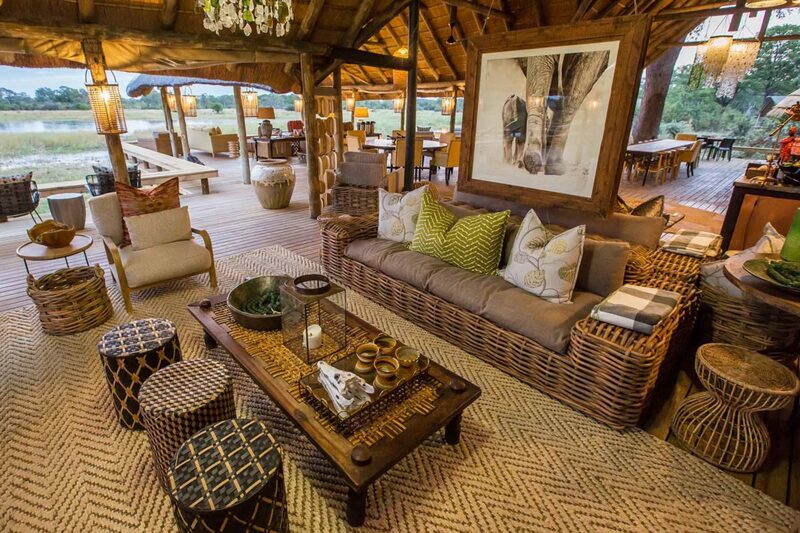 In this regard, there are no extravagant finishes, with an emphasis more on simplicity. 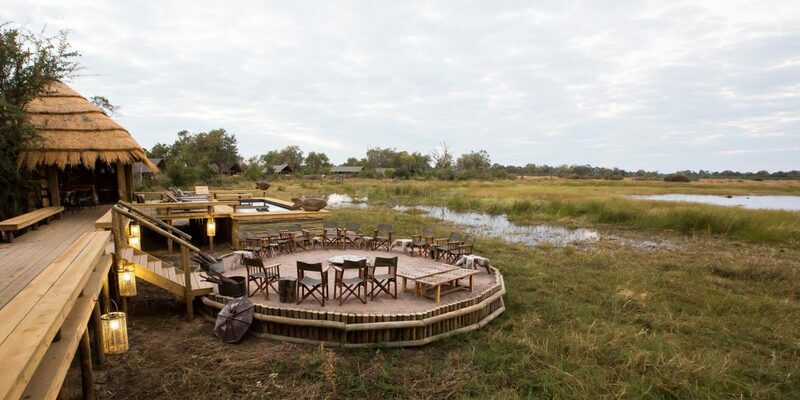 The main area is built on a raised deck, as the pan sometimes floods with heavy rain. 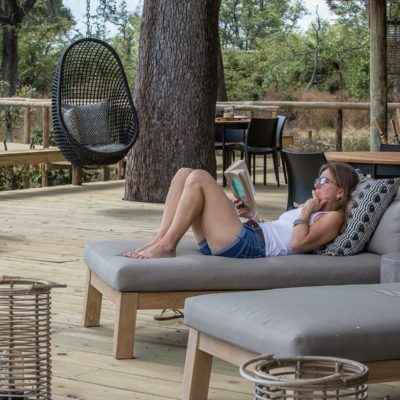 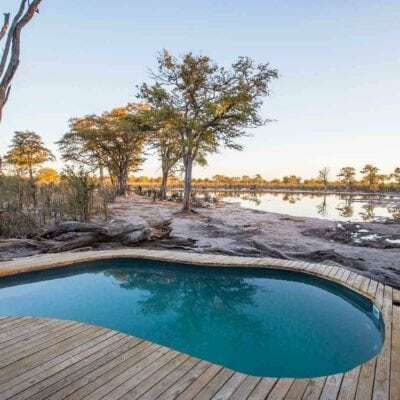 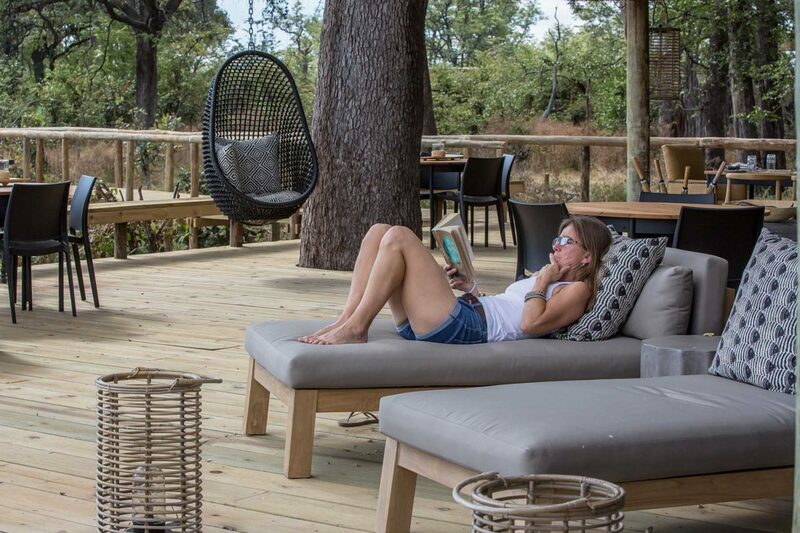 The raised views add to the dramatic location and the main area has all the basic requirements of a bush lodge – a swimming pool, simple library, various comfortable seating options for relaxing or reading and a ground level fireside area with outside dining options. 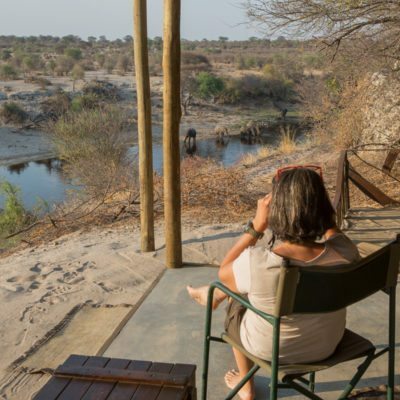 This ground level area has been sectioned off from the waterhole by huge logs – this means the elephants come in really close while you eat at ground level (Exhilarating! 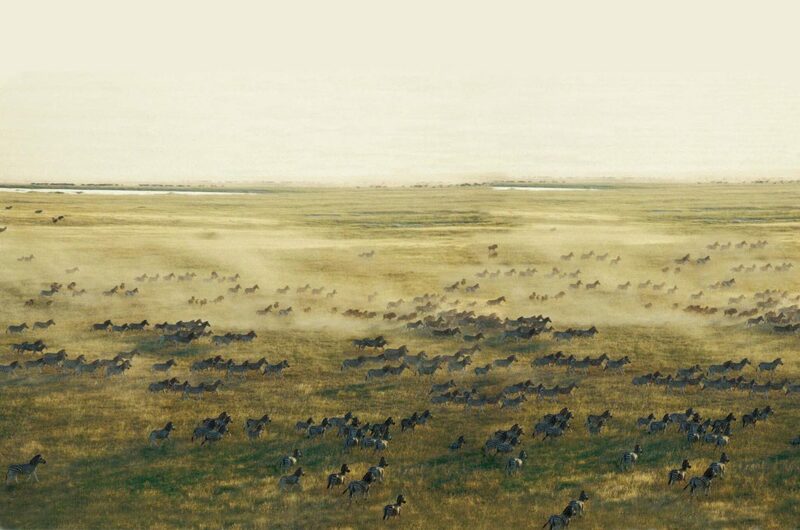 But safe of course). 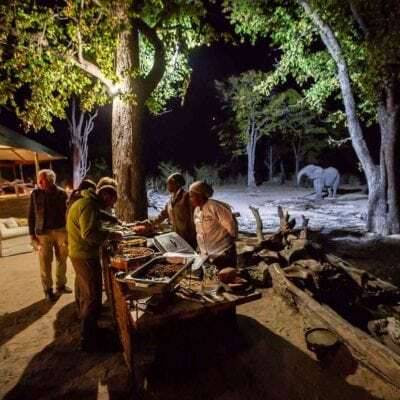 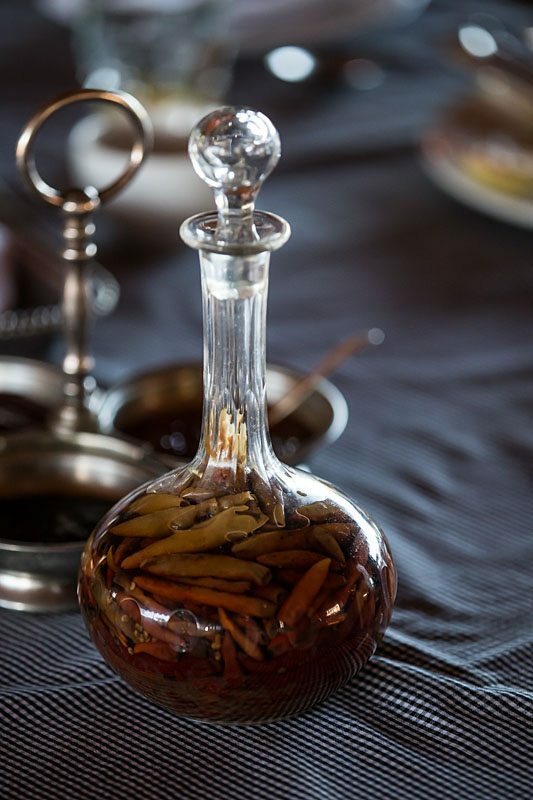 The evening dining experience is really fantastic because of this, and the waterhole is flood lit to add to the experience! 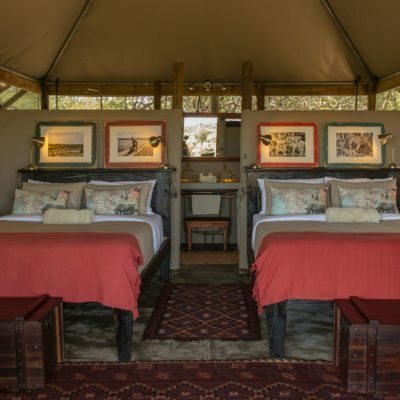 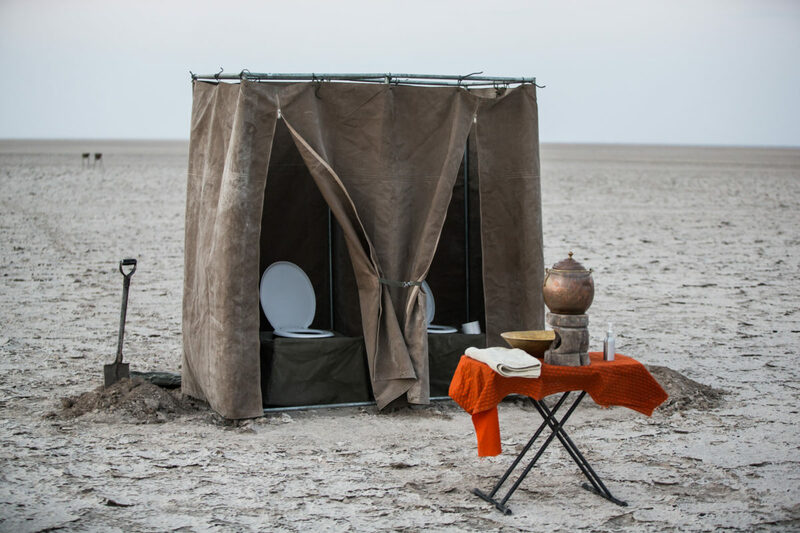 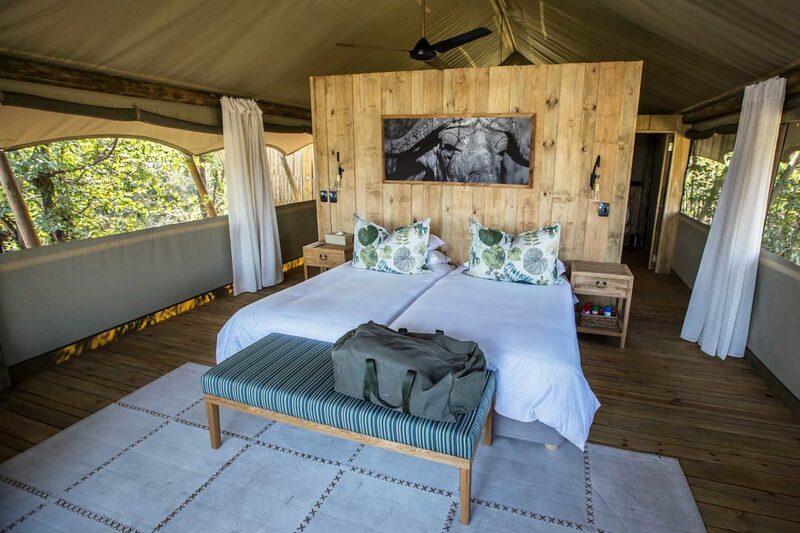 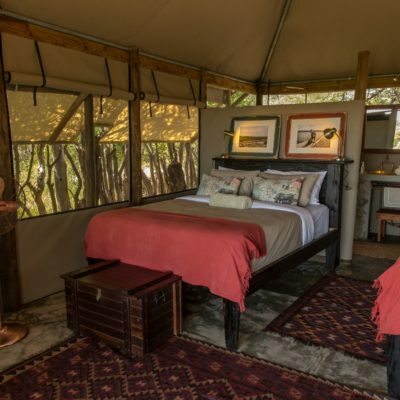 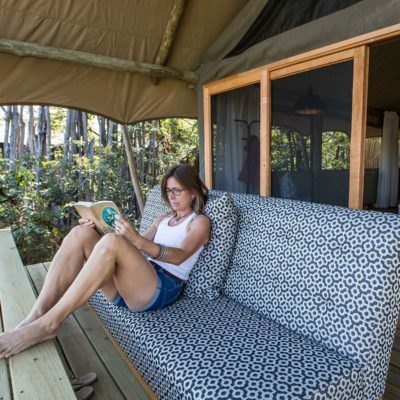 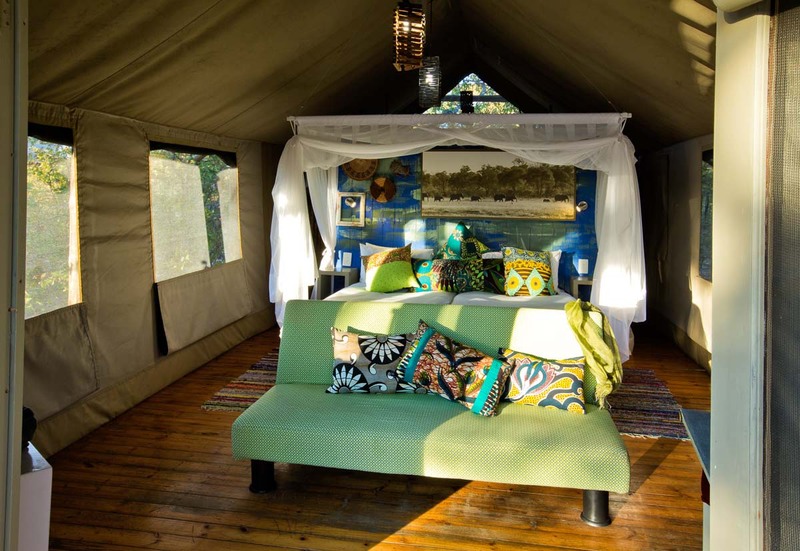 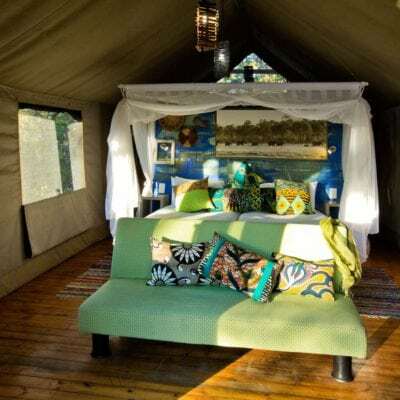 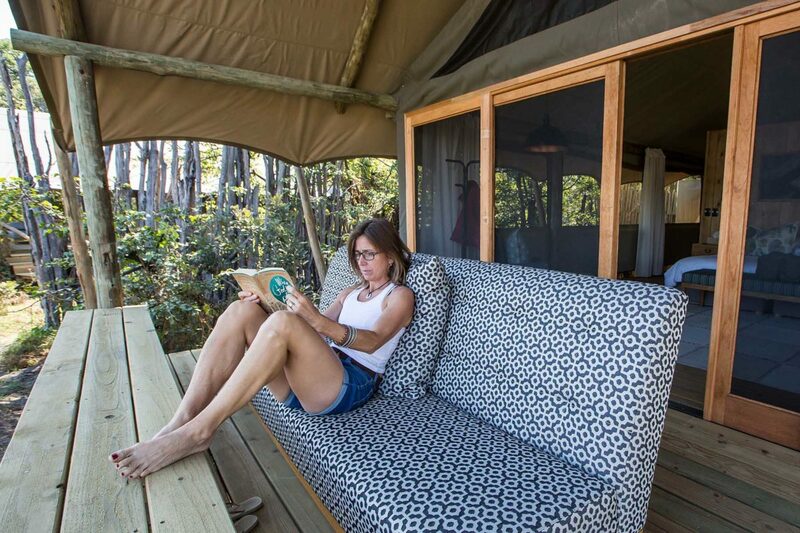 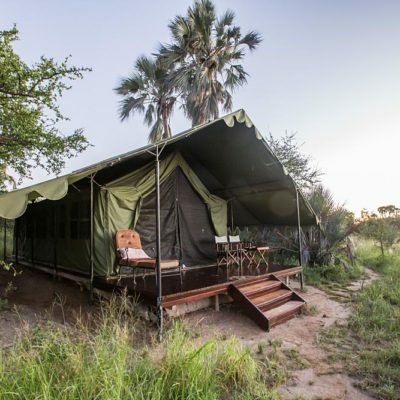 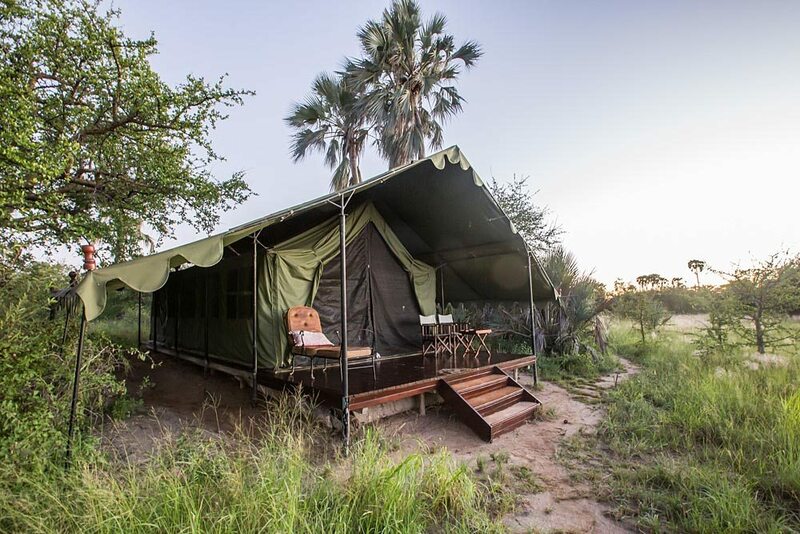 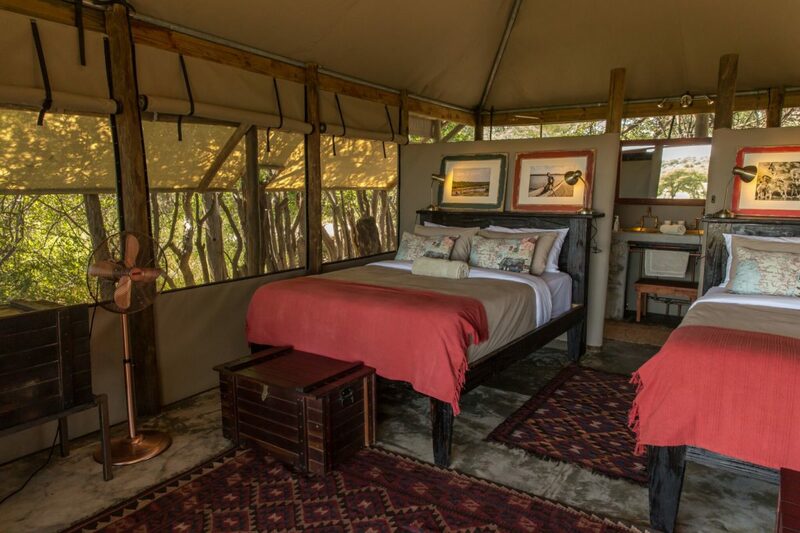 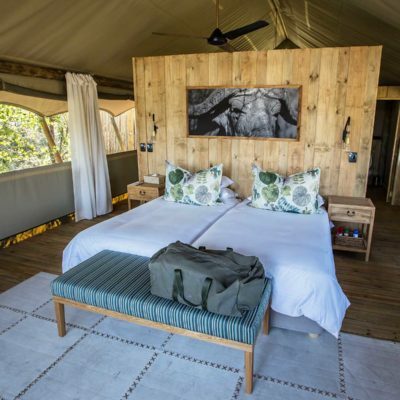 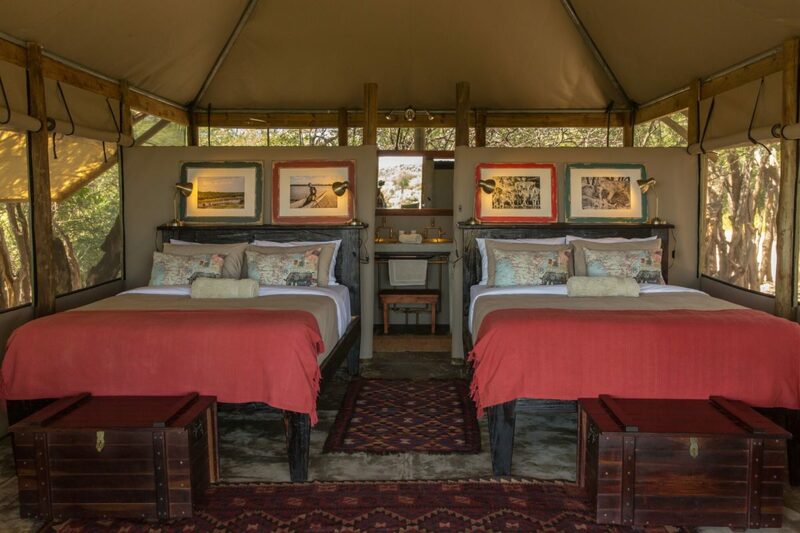 The Meru tents are functional and well appointed while maintaining the character of a traditional canvas “bush camp.” Everything you need is in there – hot shower, twin or double beds, good lighting and a splash of colour. 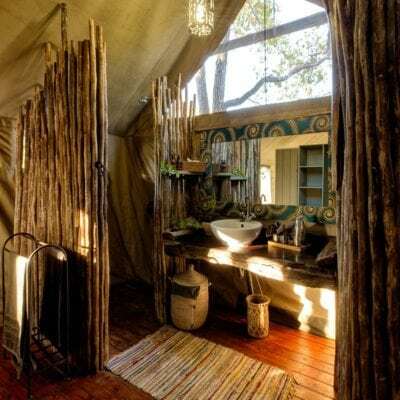 The inside of the menu tents are a lighter shade of canvas and the wooden decked and carpeted floors make the tents rather homely. 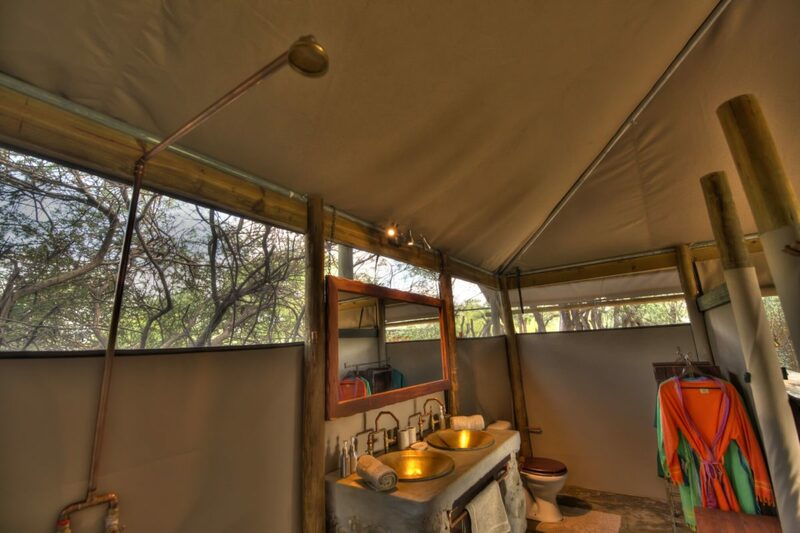 Hyena Pan has tried to be as eco-friendly as possible so each room uses solar lighting and gas geysers for hot water. 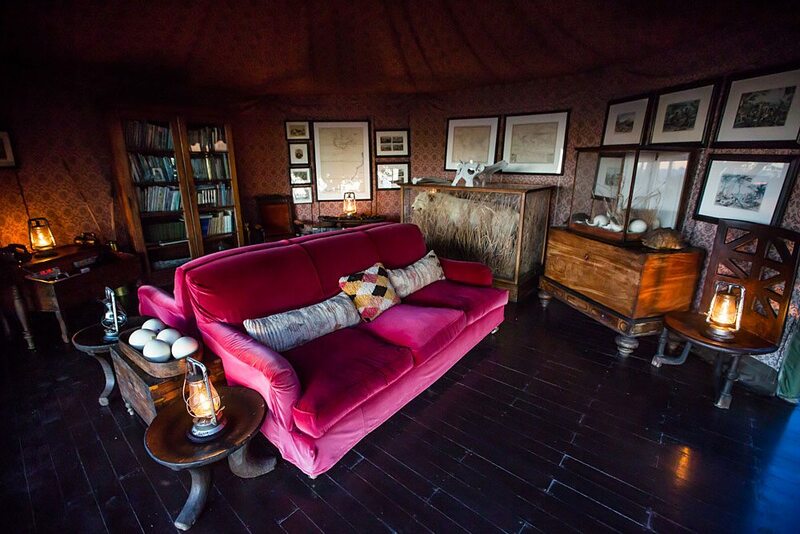 Pathways to the rooms remain on the ground (not decked) and there is no WIFI. 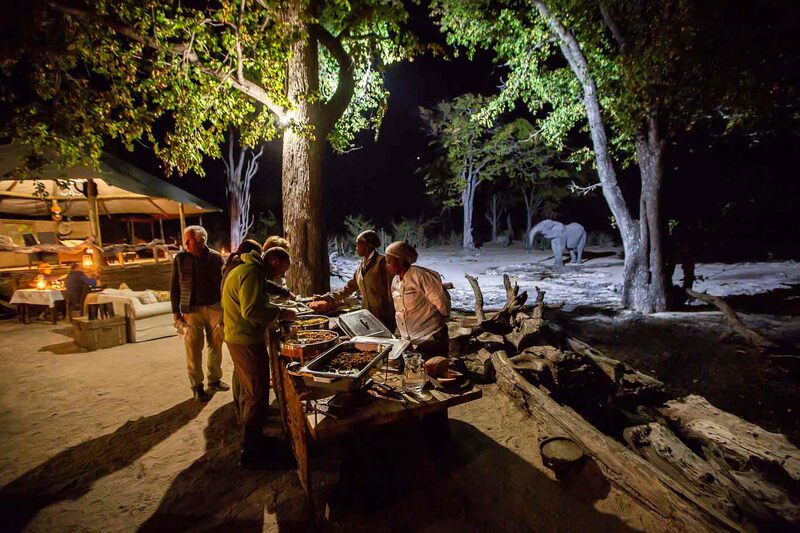 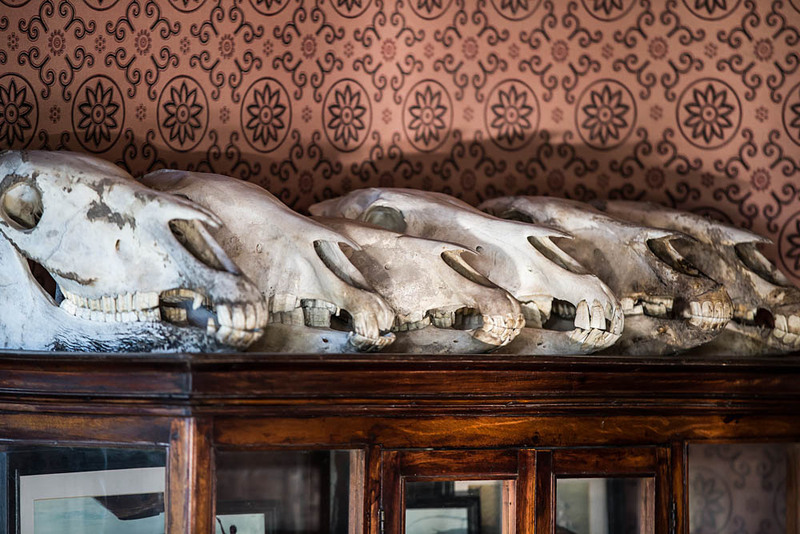 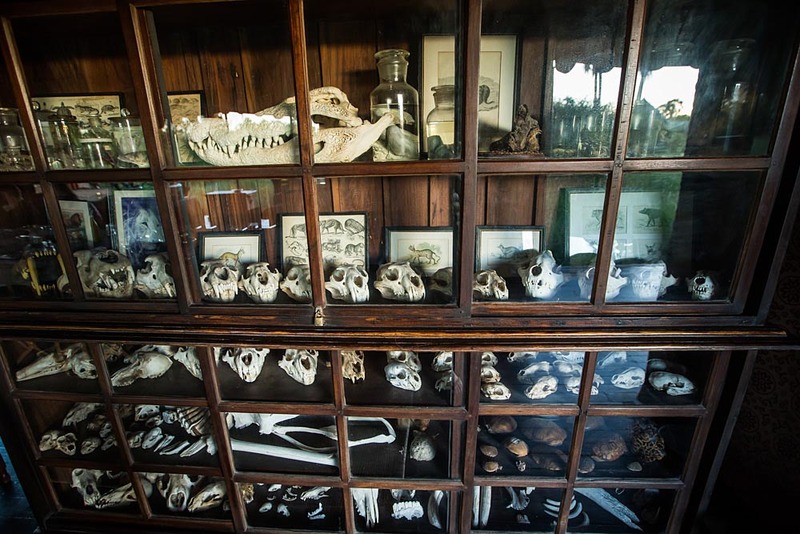 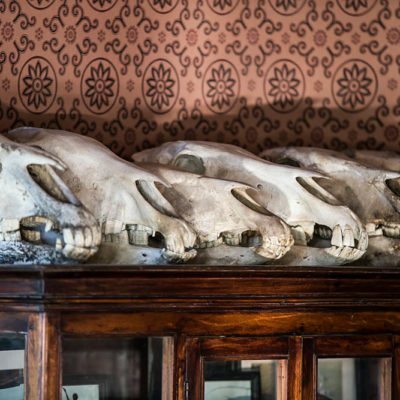 With so many lodges now being out of touch with their original owners, we find Hyena Pan to be a welcome return to the traditional way safari camps were run. 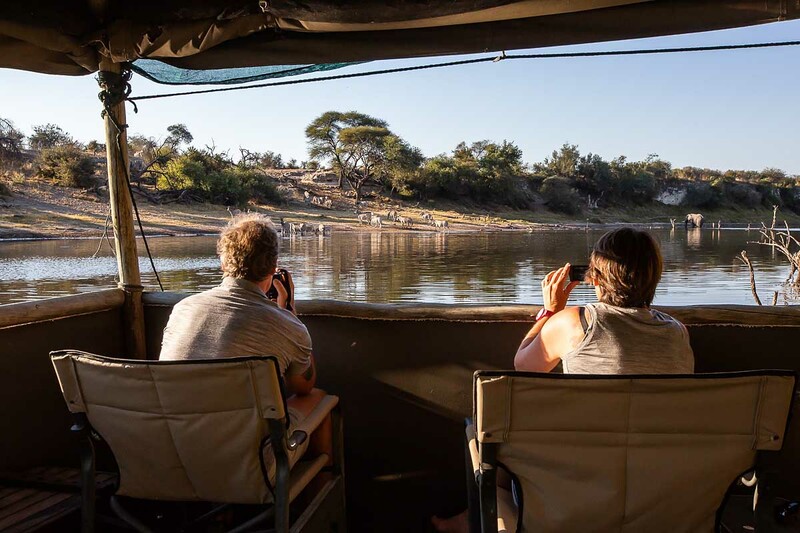 You will feel like a friend of the managers almost immediately and will note that they have a personal hand involved in the way the camp is run. 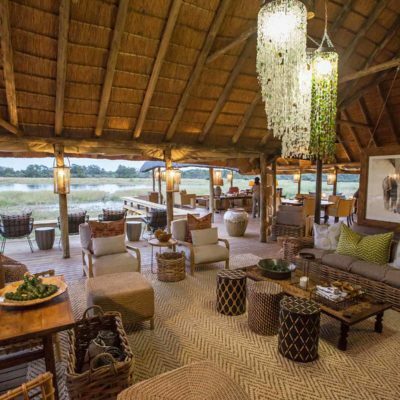 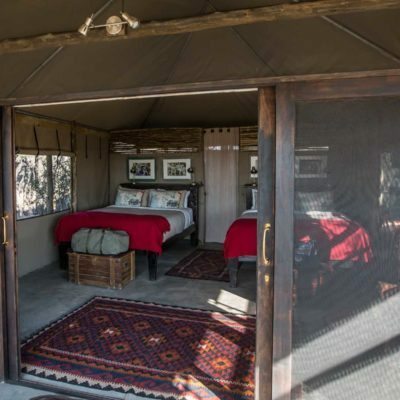 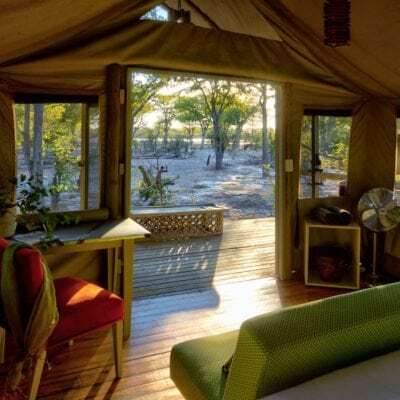 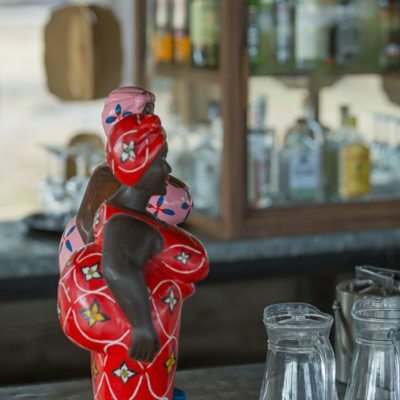 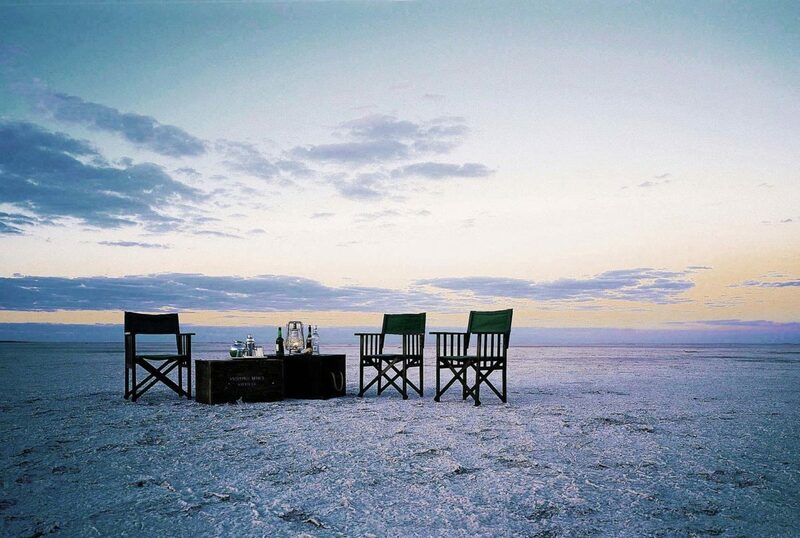 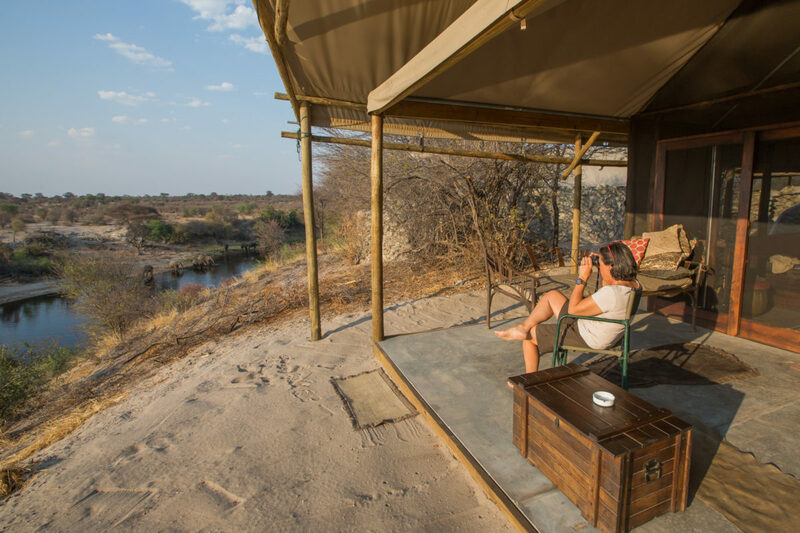 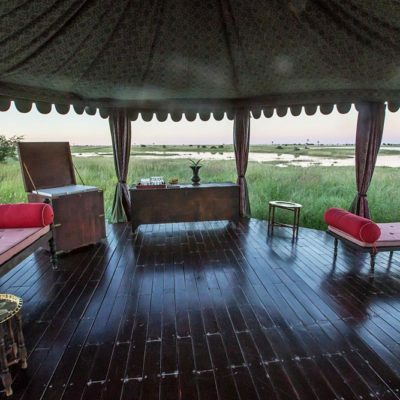 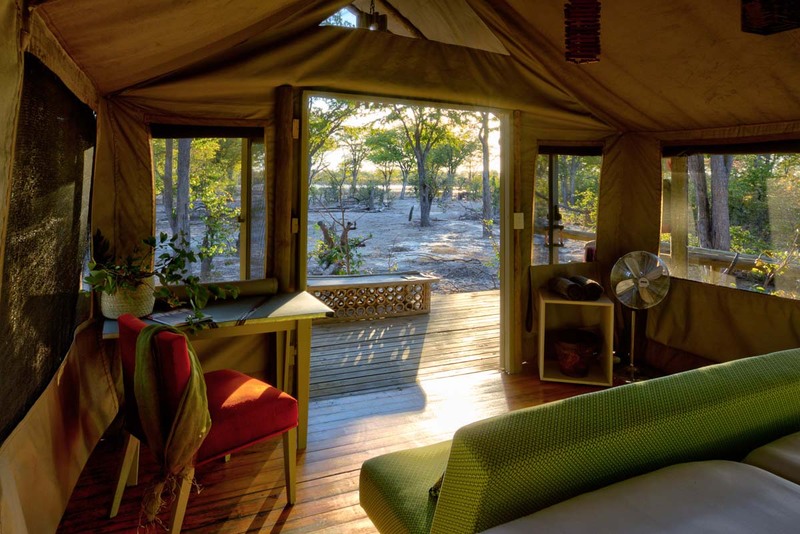 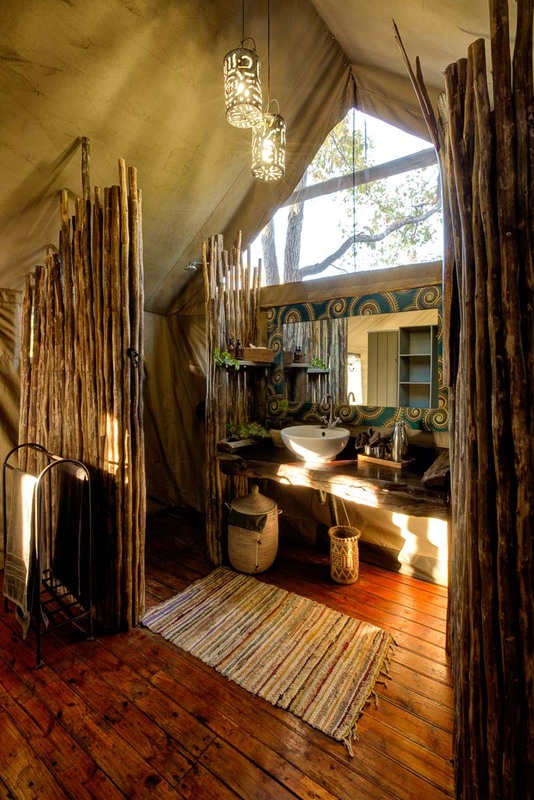 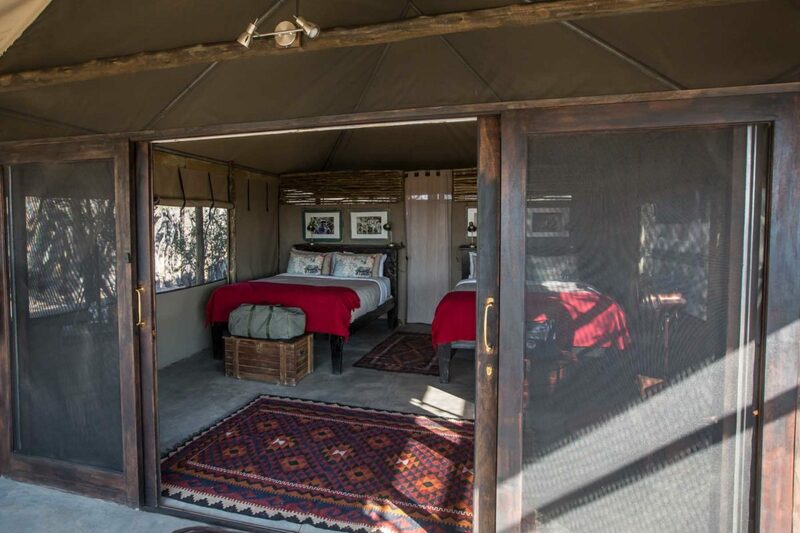 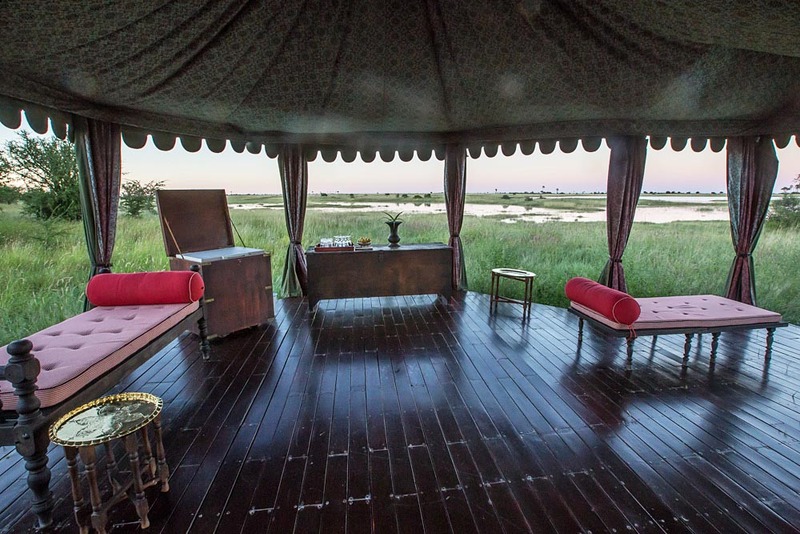 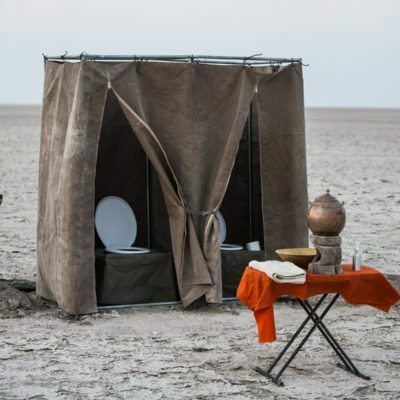 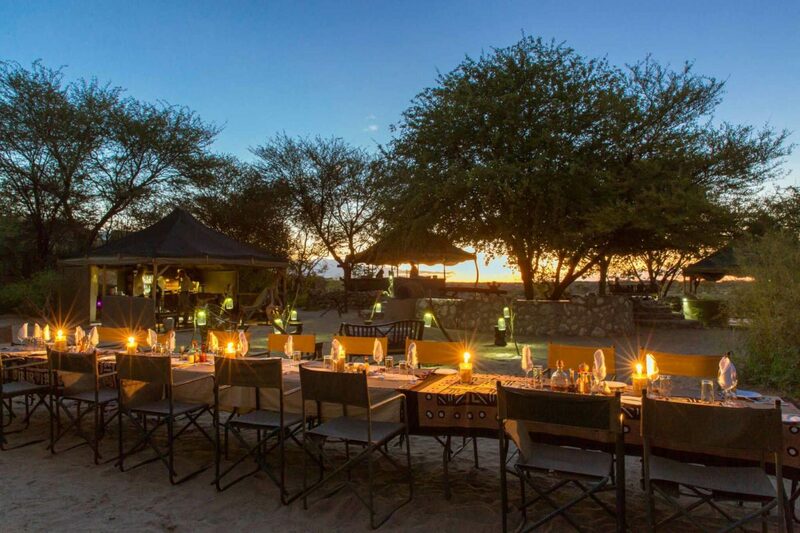 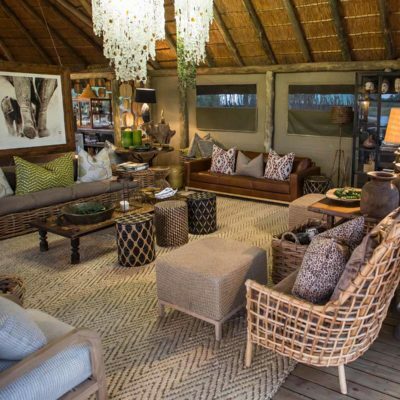 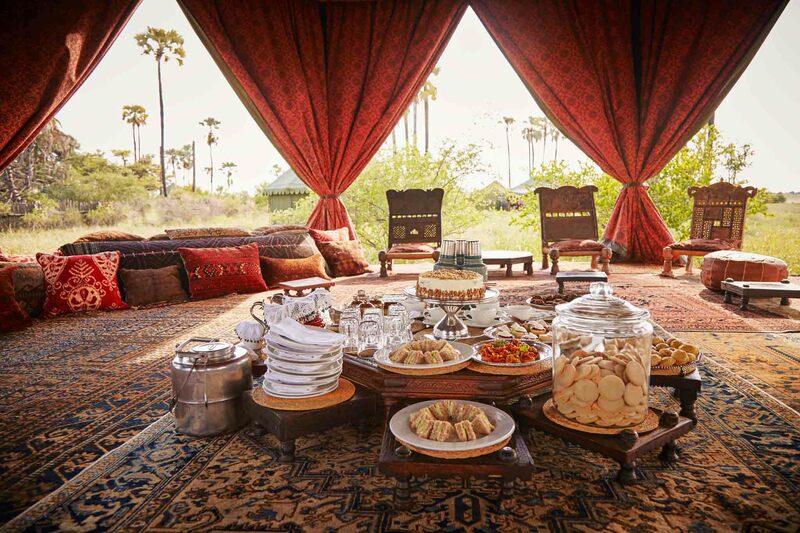 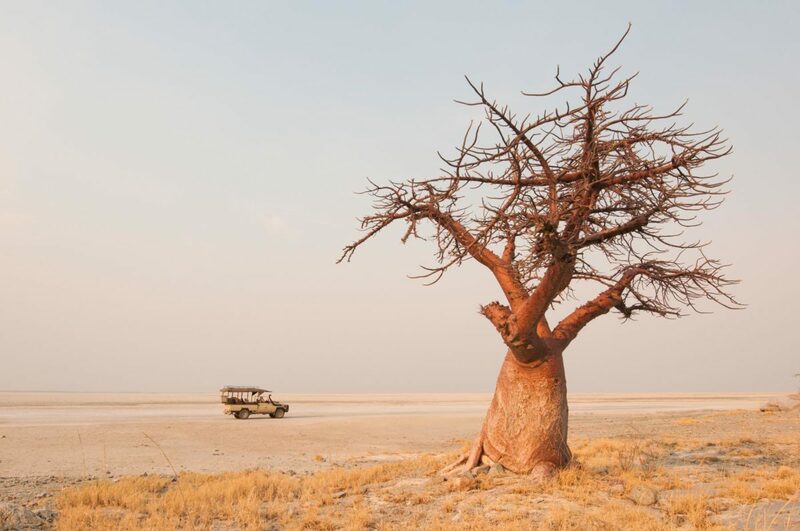 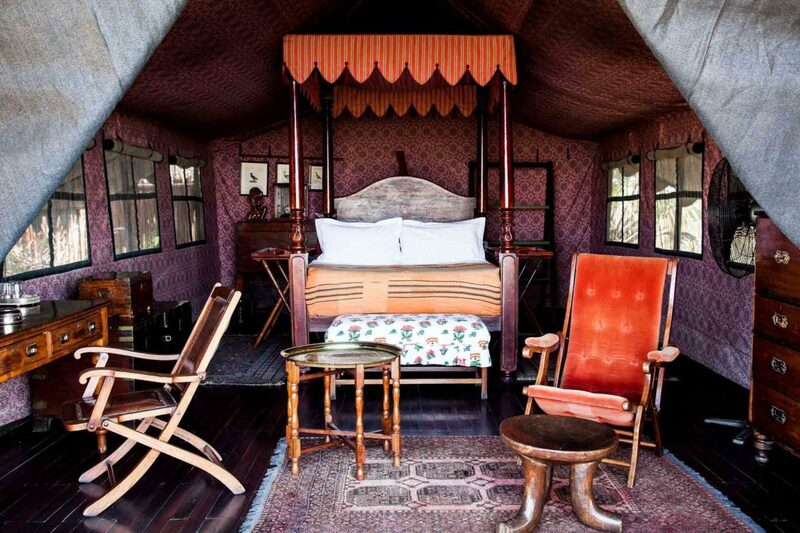 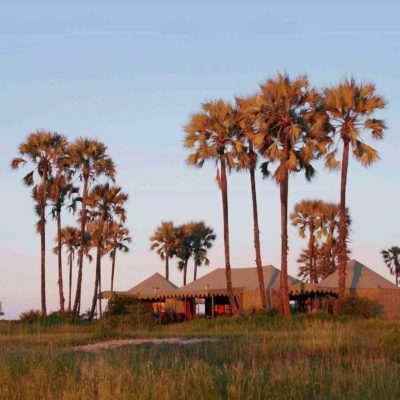 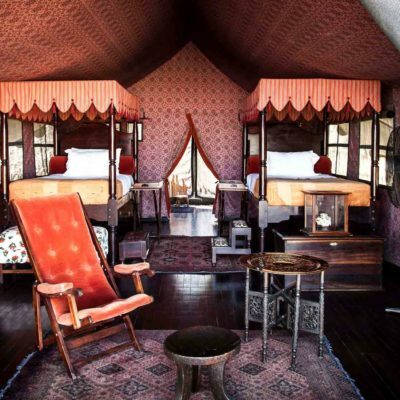 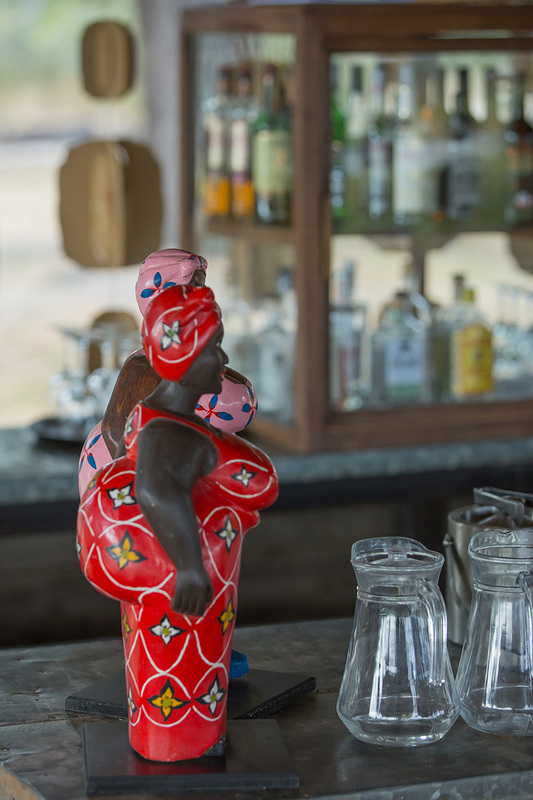 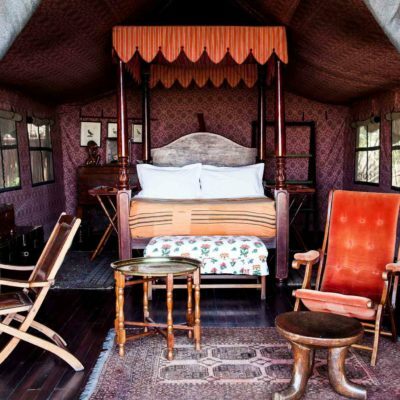 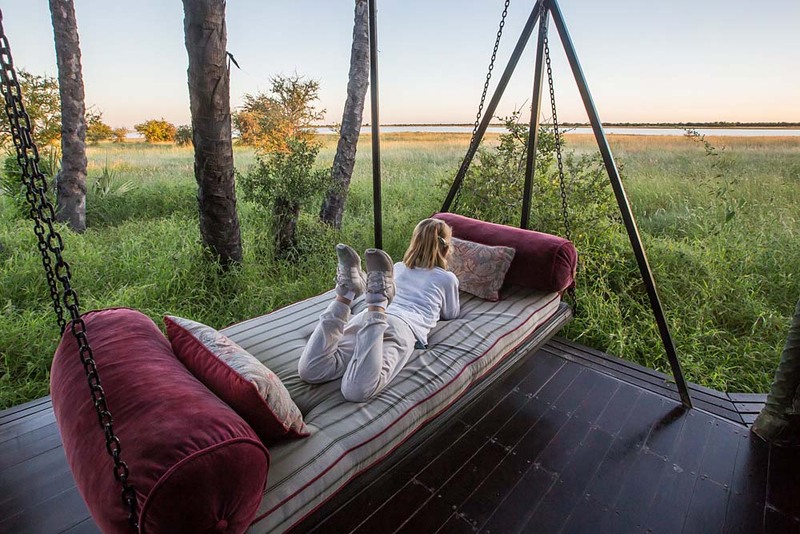 Further, the decor has not lost touch with the way the first “bush camps’ in Botswana were designed – simple is better is what works at Hyena pan. 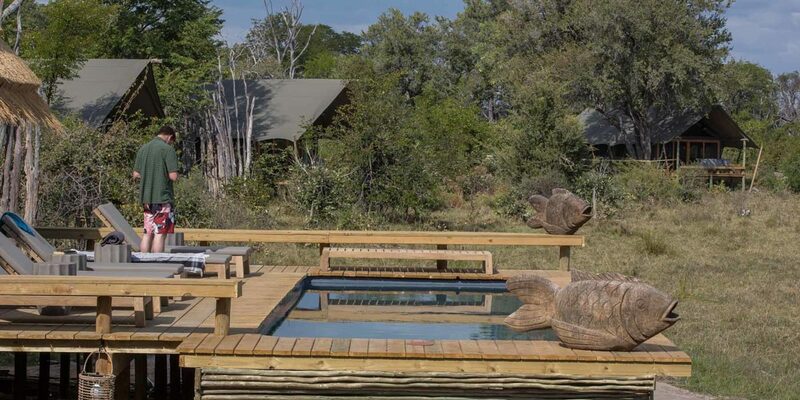 It also suits those looking for lodge options on the lower scale of prices. 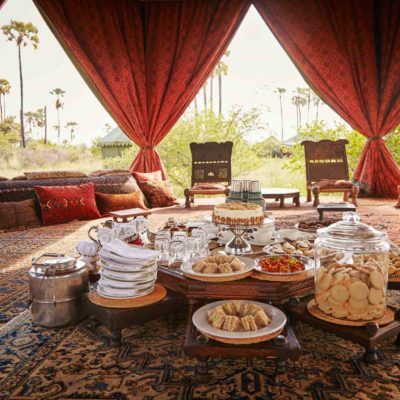 Eating is mostly done privately on smaller tables in your own groups or families – no forced interaction if you don’t want it. 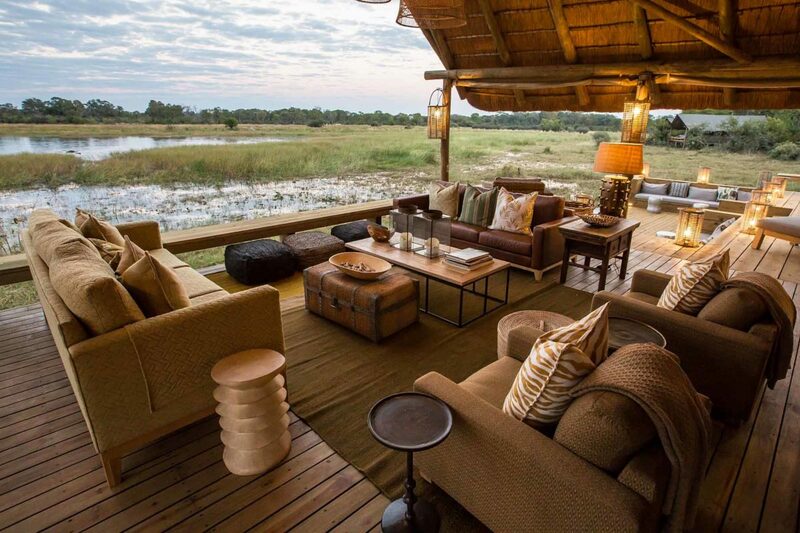 We like this option. 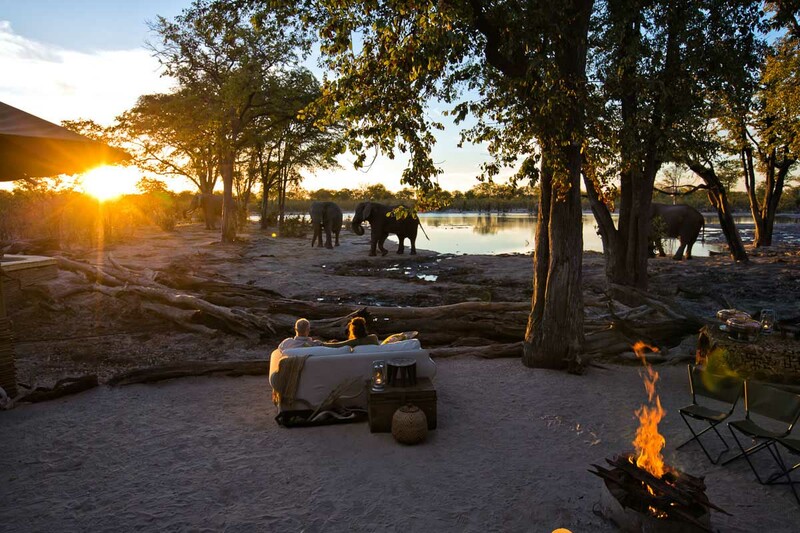 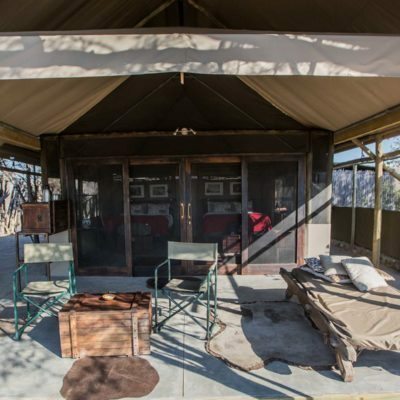 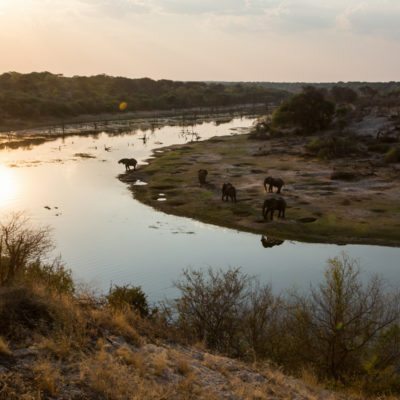 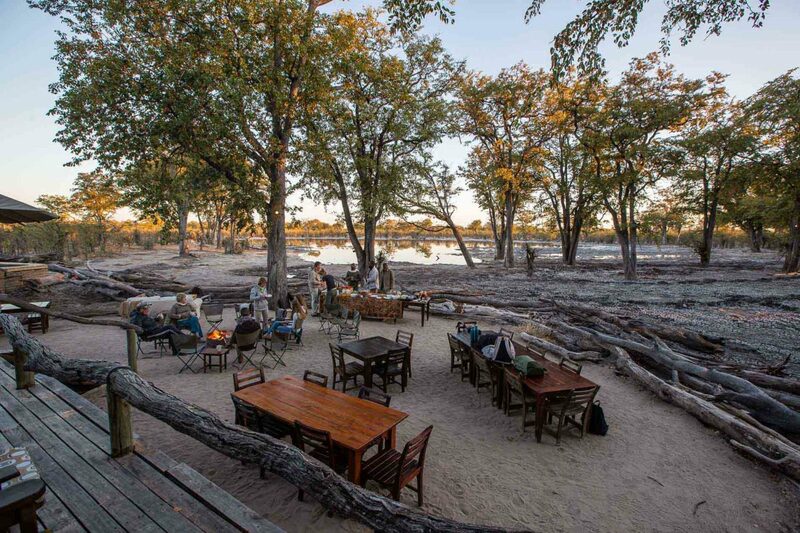 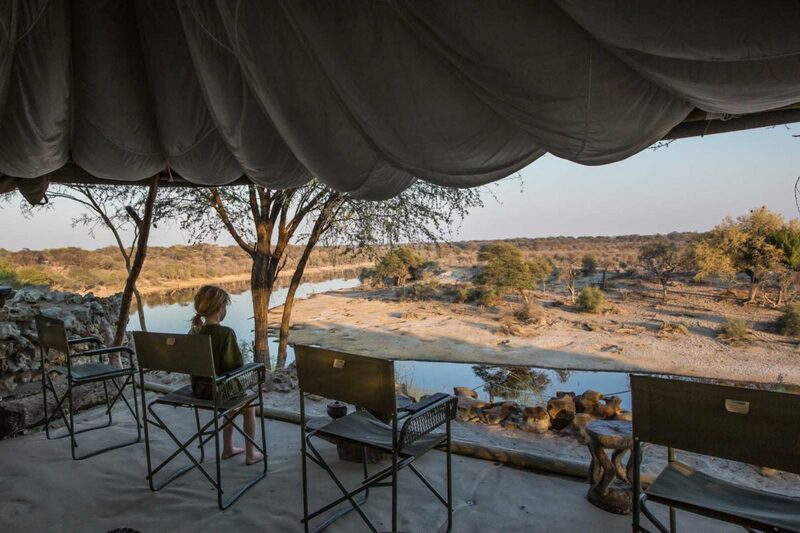 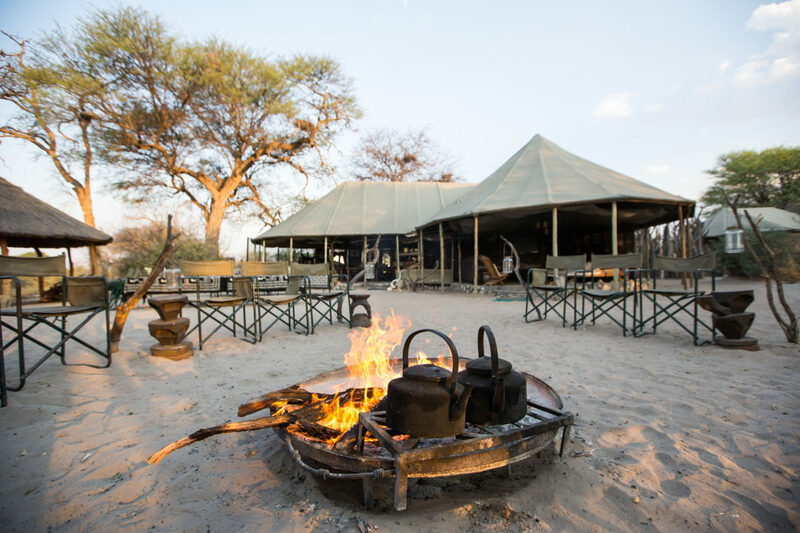 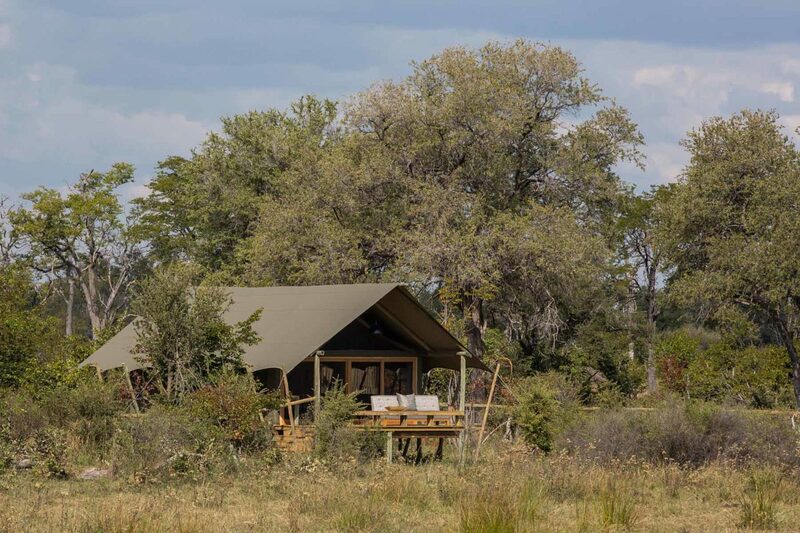 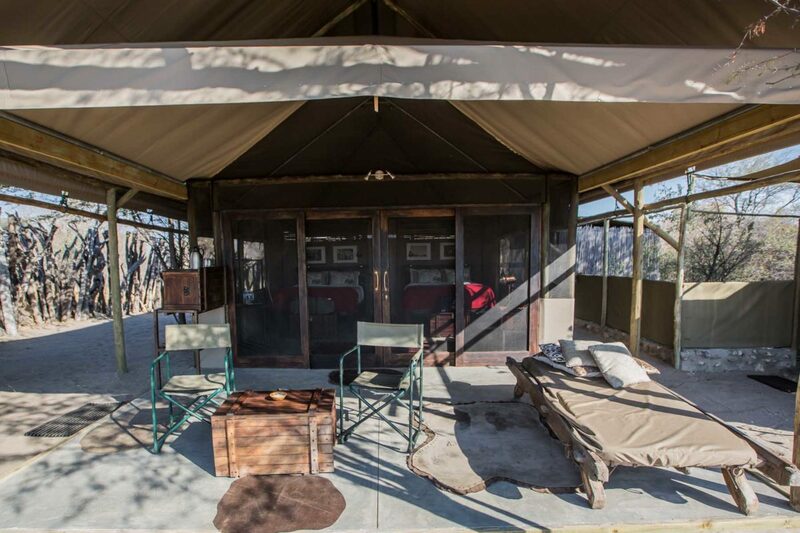 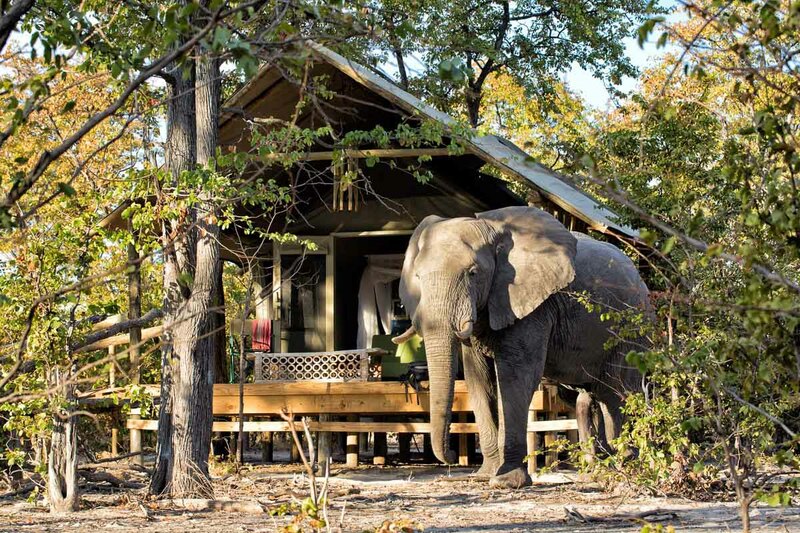 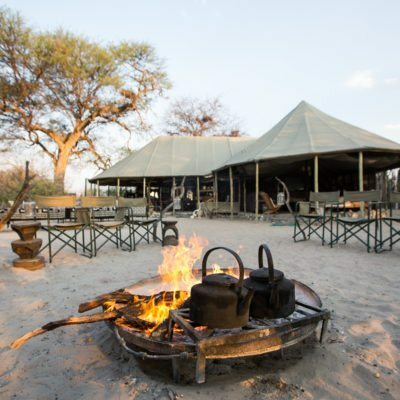 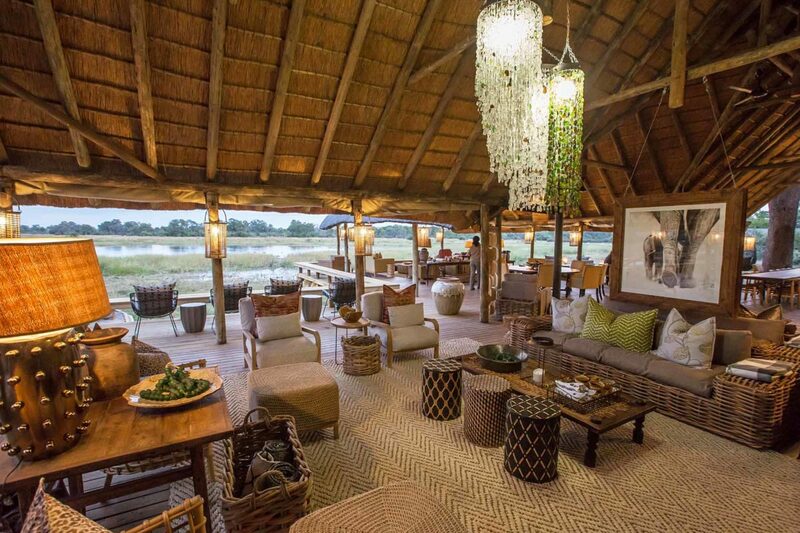 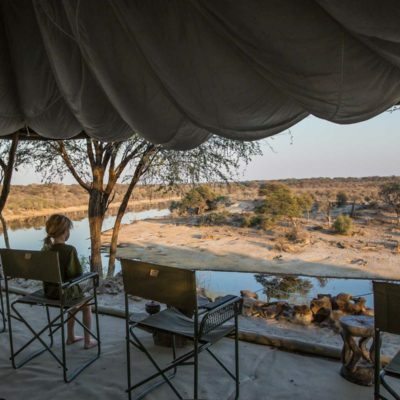 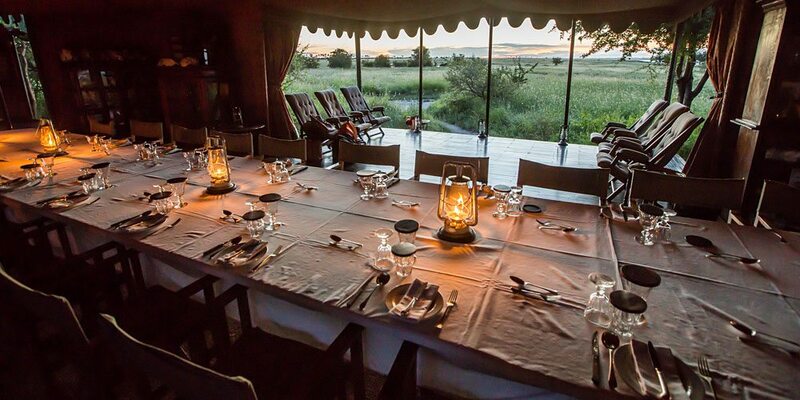 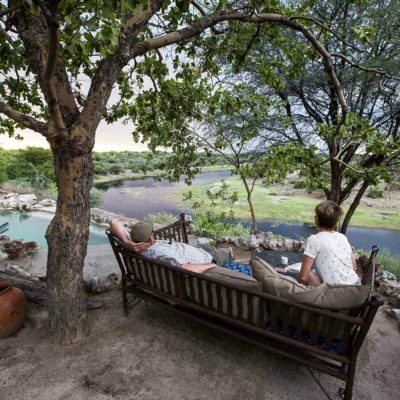 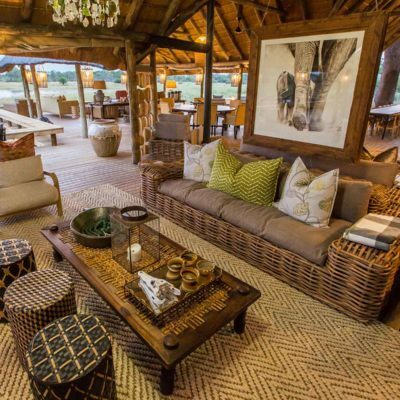 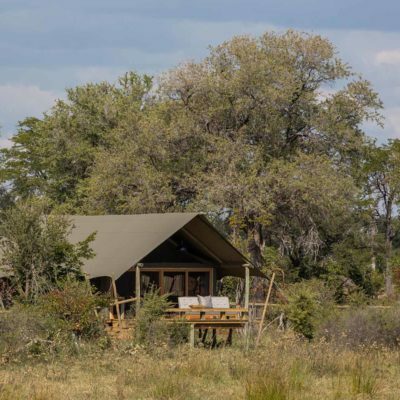 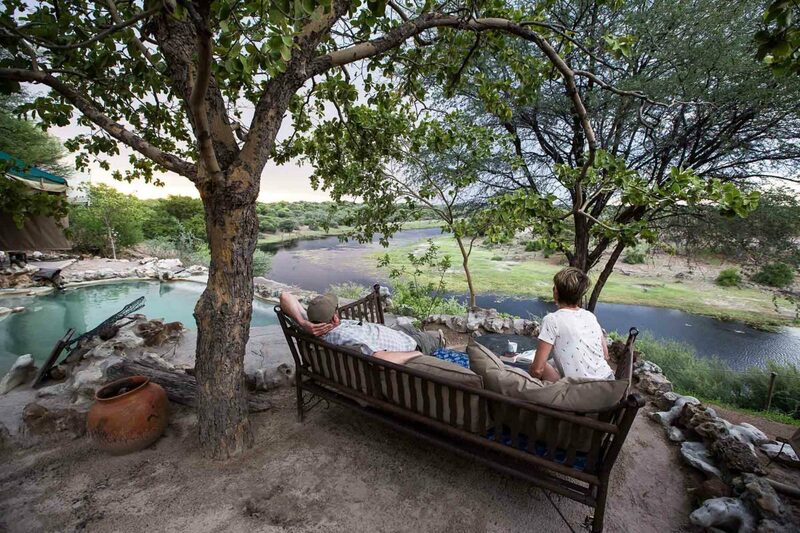 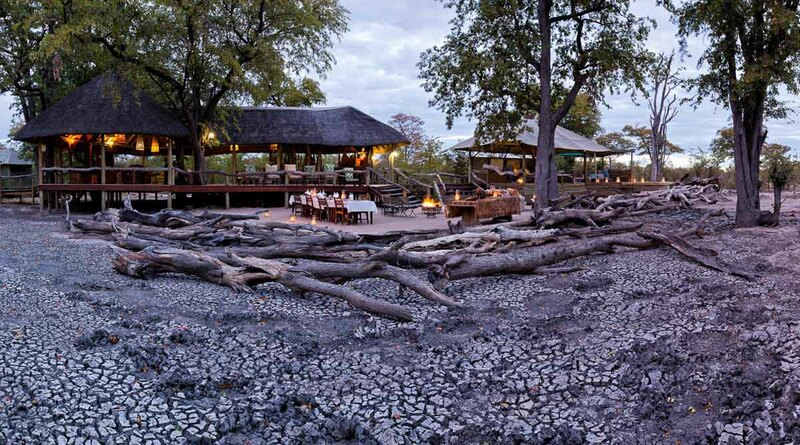 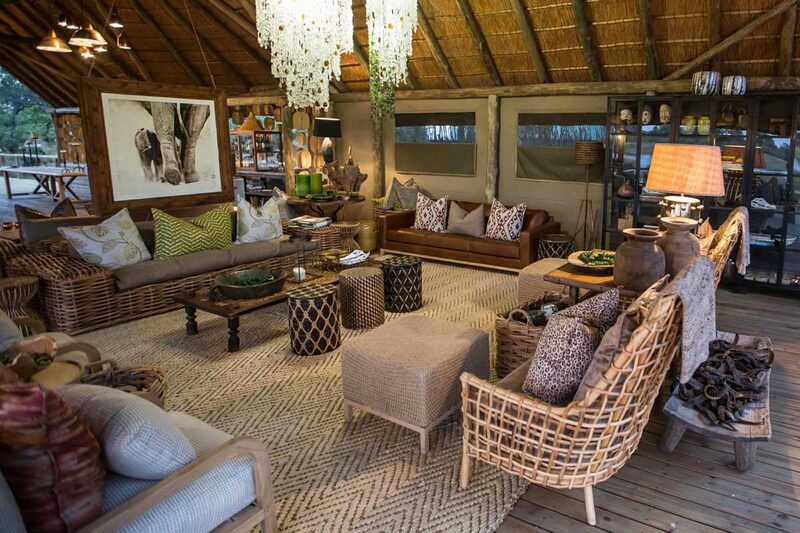 We like the fact that this lodge has a productive waterhole in front of camp – you might choose not to leave camp! 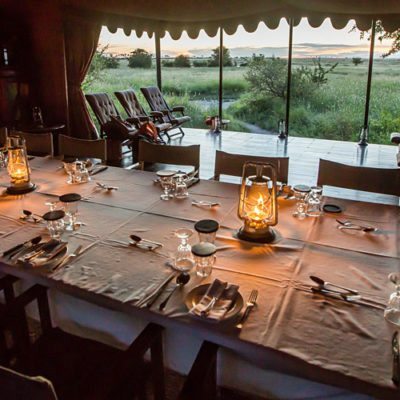 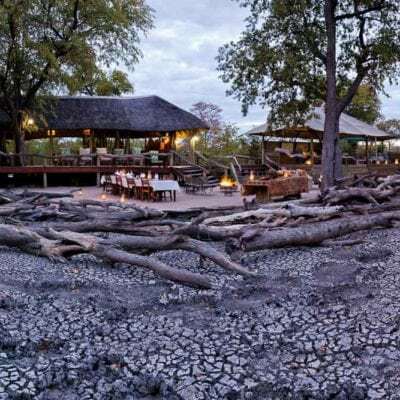 Waterhole game viewing is underrated indeed, so it is refreshing that there are safari camps that specialise in it. 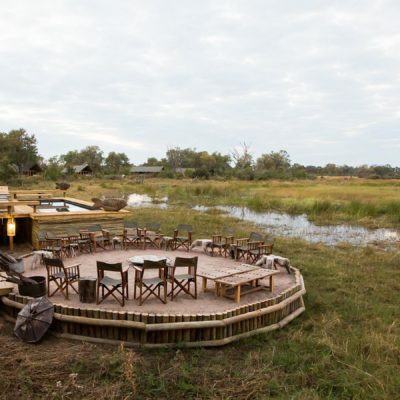 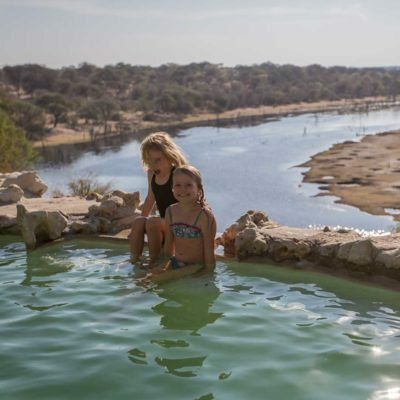 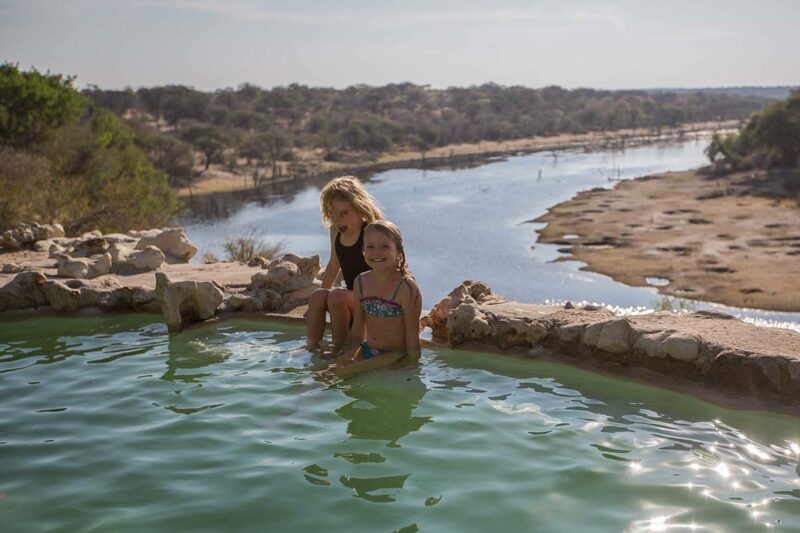 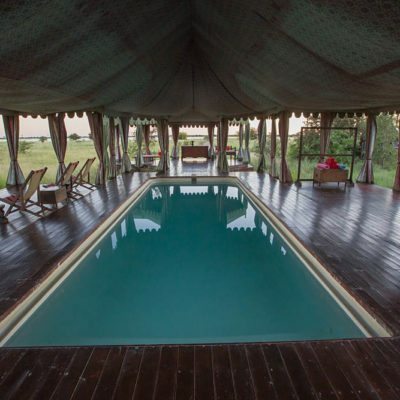 We like the innovative activities like the sunken hide, the platforms at waterholes and the SKYBEDS! 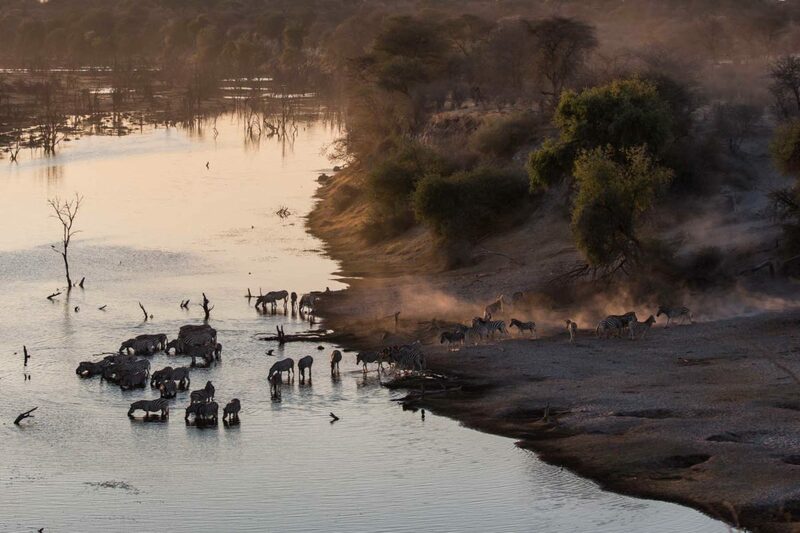 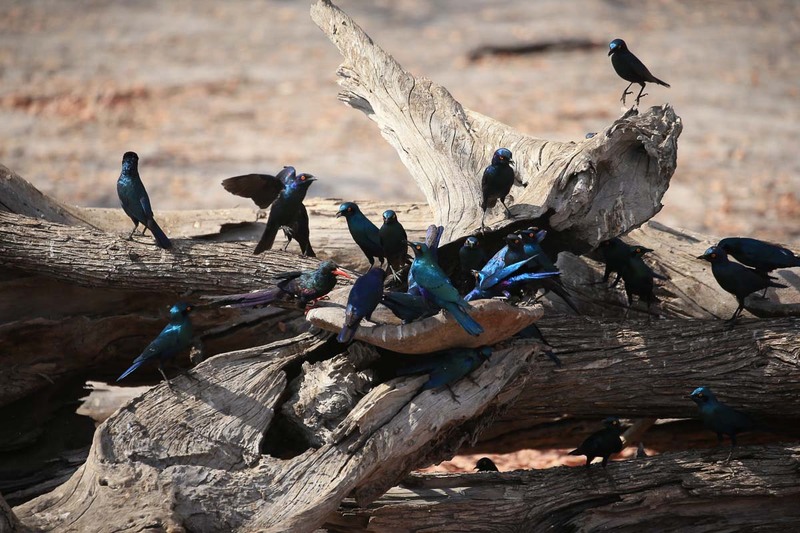 Visit in the hot dry season (August – to the end of November) to see the waterholes at there most productive. 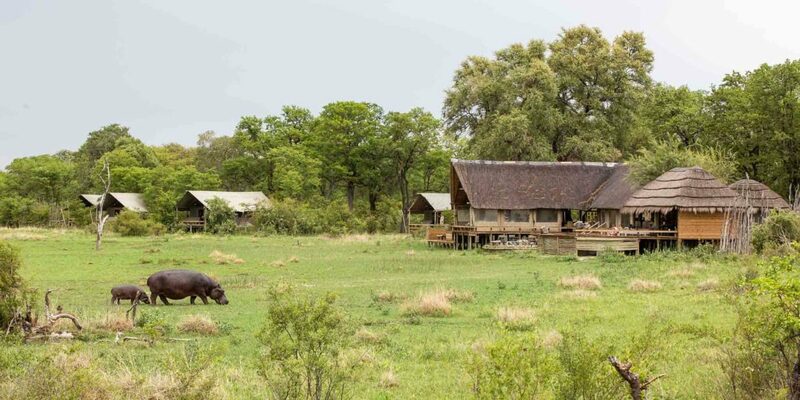 Safaris in the rain season might have less game viewing possibilities. 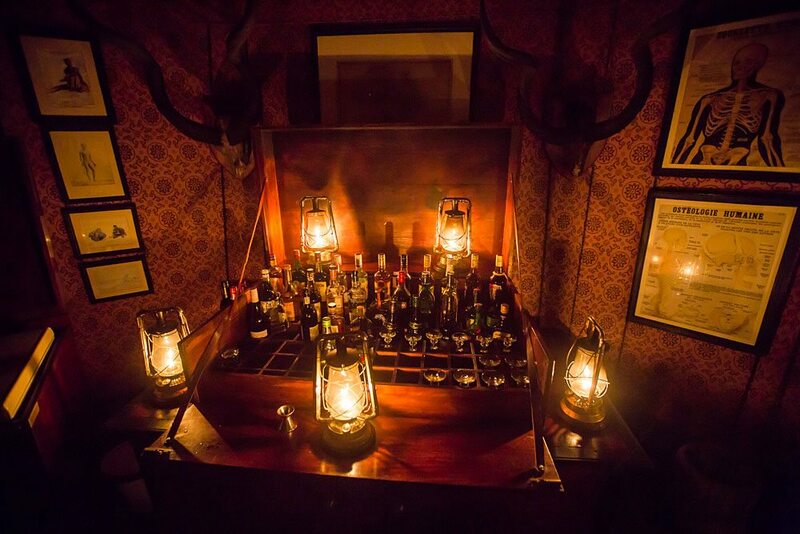 Ask us for advice.